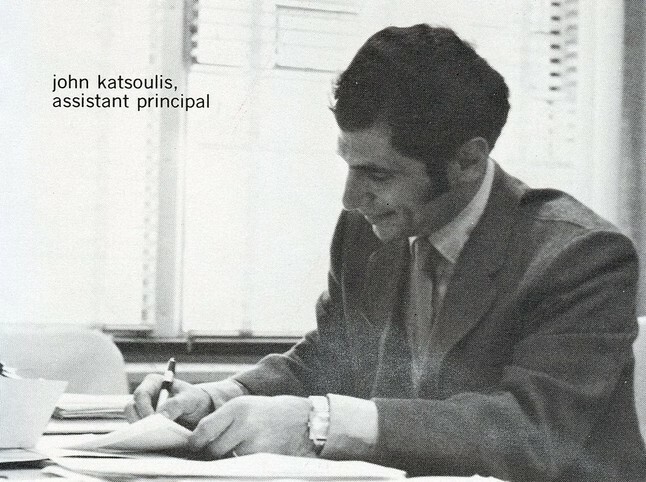 This page features information on the status of personnel who served us during our time at East Longmeadow High School. 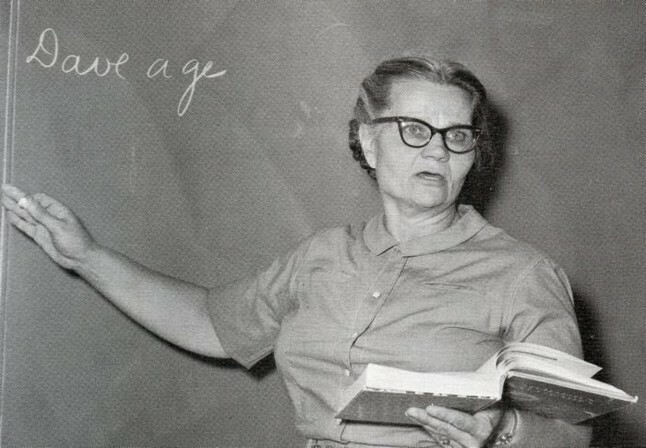 For the status of personnel between kindergarten and eighth grade, please hover over the Kindergarten Thru 8th Grade link and select the school of interest. 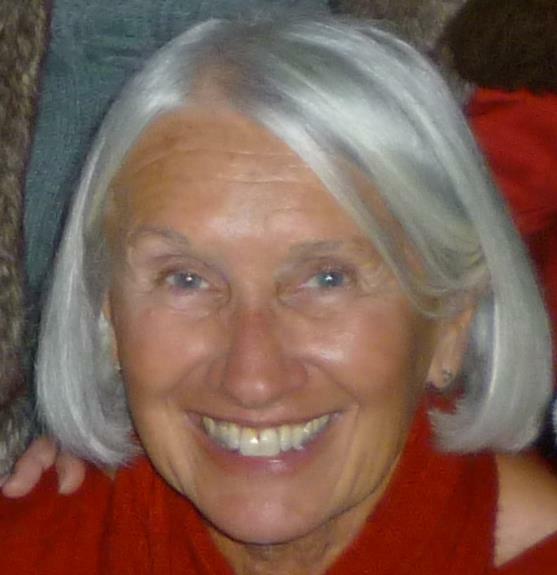 Please contact us with updates. 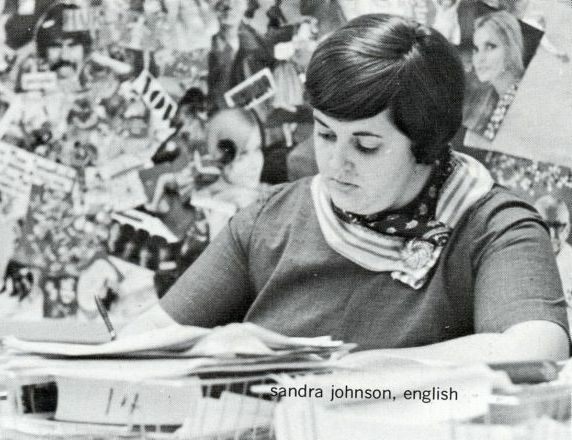 Here are some photos of our teachers and staff from the 1982-83 school year, courtesy of the ELHS 1983 yearbook. 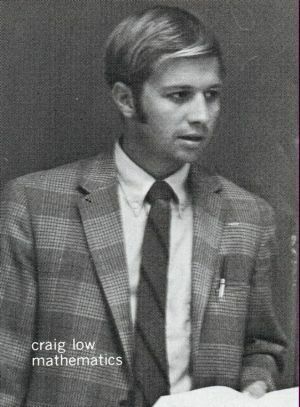 Quite a few were still at ELHS at that time. 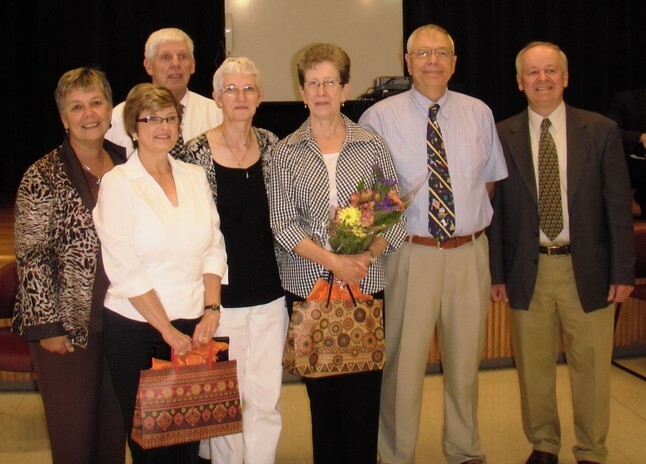 Superintendent of Schools Dr. Wayne Porter; secretaries Mrs. Agnes Livingstone and Mrs. Dolores Munzert; guidance counselors Mrs. Diane McCormick (we knew her as math teacher Miss Diane Tarrant), and Mr. Robert Camp. 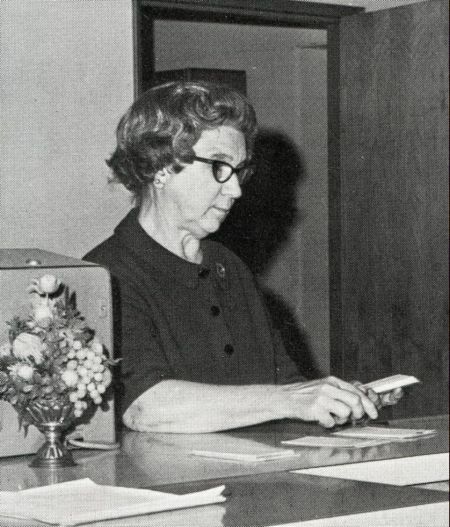 Librarians Mrs. Lois Lopes and Mrs. Romayne Kielar (a secretary during our time); math teachers Mr. Francis Dutille, Mr. Manford Mann, and Mr. Walter Porowski. 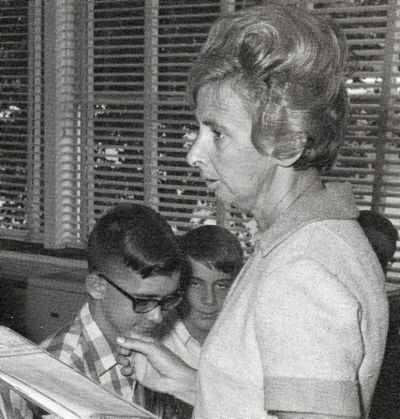 Science teachers Mrs. Susan Goldie (we knew her as Miss Susan Johnson) and Mr. Lloyd Dale; music teacher Mr. Richard Cheney; art teacher Mr. Richard Goldie. 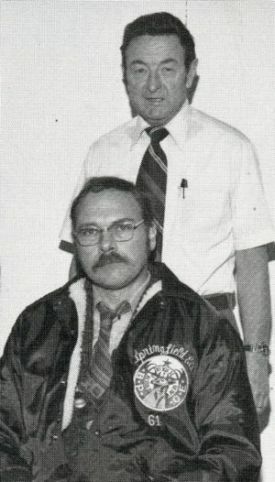 Industrial arts teachers Mr. Charles Burtt (seated) and Mr. Stanley Bernatowicz. 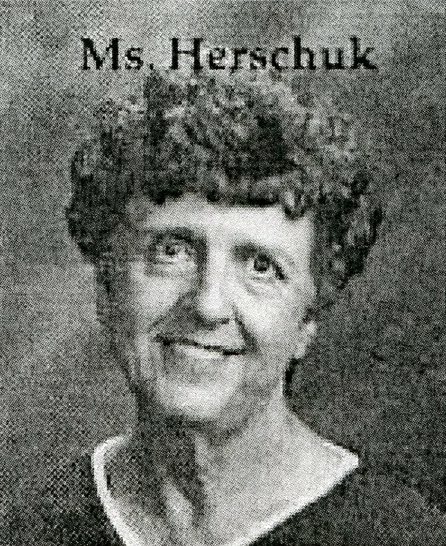 Business teachers Mrs. Marina Herschuk, Mrs. Aileen Redler, Mr. Ralph Cooley, and Mr. Joseph St. Germain. 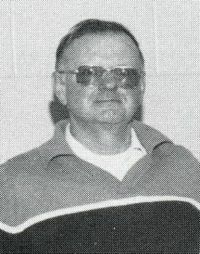 Physical education teachers Mr. Robert Dobias, Miss Janet Kerr, Miss Jakie Upshaw, and Mr. Richard Bolles. 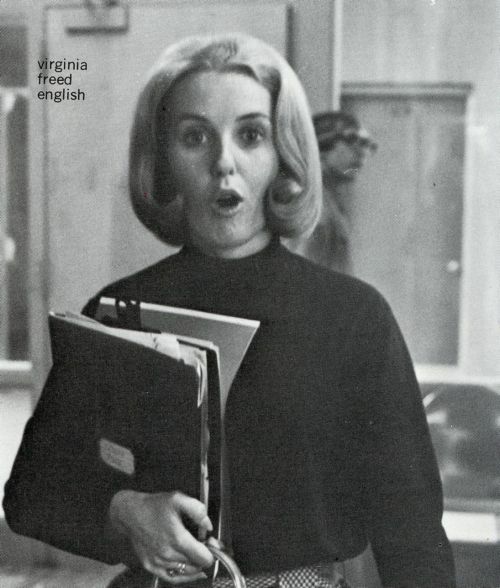 English teachers. 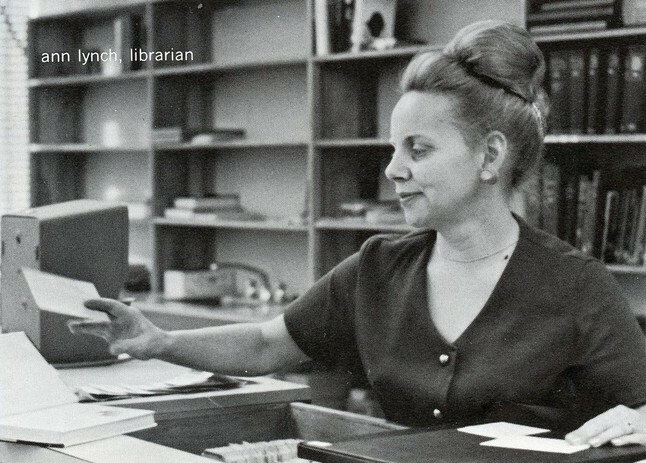 Seated: Mrs. Ruth Yetwin, Mr. Charles McKinney, Mrs. Dorothy Allard, Mr. James Grocott, Miss Deborah Fay, Mrs. Ann Lynch (the librarian during our time). 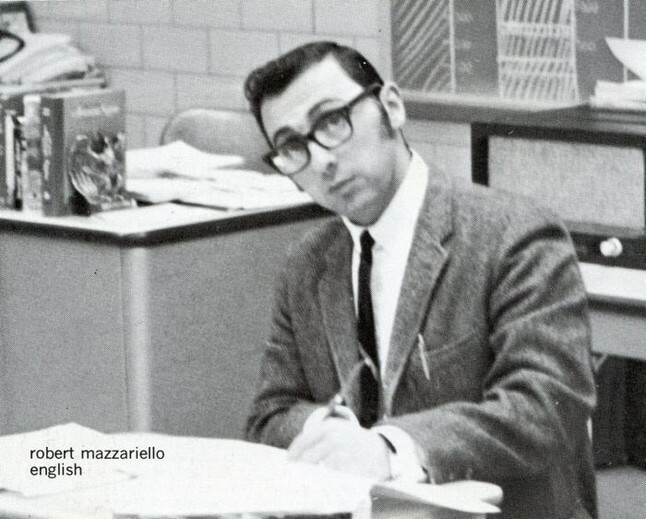 Standing: Mr. Robert Mazzariello, Mr. Raymond Simonds, Mr. Joseph Calabrese (not on faculty during our time). 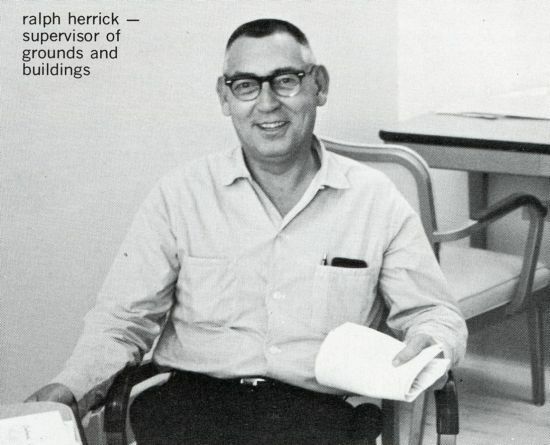 Not pictured: Miss Judith Sessler, Mr. Irwin Kerson. 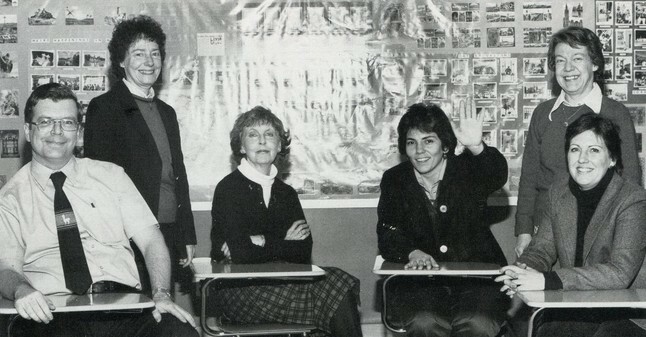 Foreign language teachers Mr. Dennis Dowling, Mrs. Onaita Tibbetts, Mrs. Kathy Payne, Miss Jeanne Mele (not on faculty during our time), Mrs. Rachel Fleming (standing), and Mrs. Christine Manville. 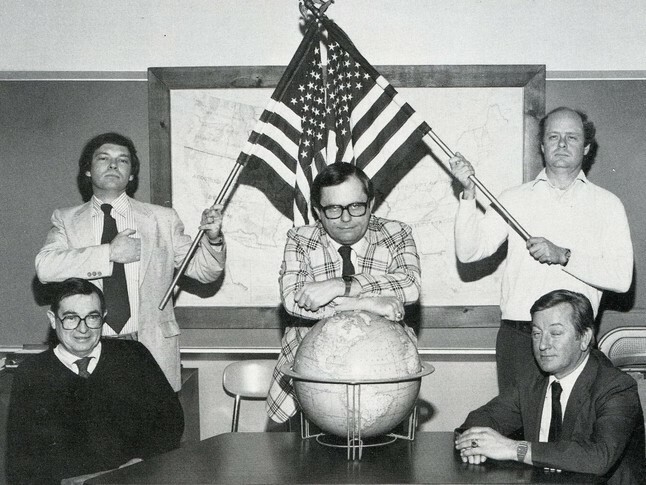 Social studies teachers. 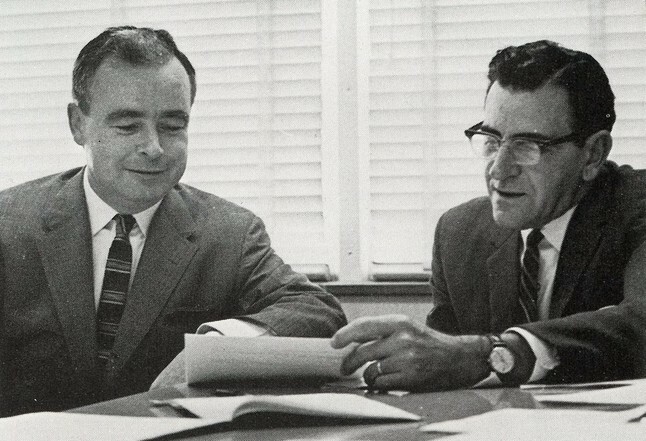 Seated: Mr. John Roan, Mr. Ronald Sarazin. 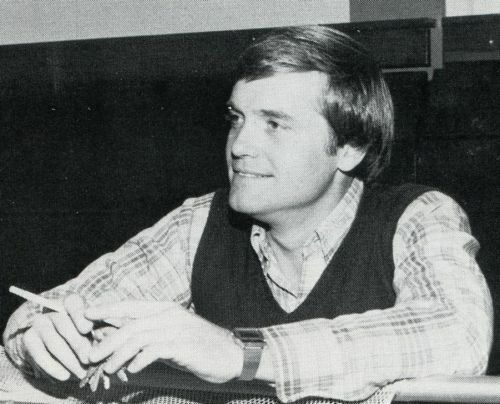 Standing: Mr. Vickers (not on faculty during our time); Mr. Ronald Lech; Mr. Marden (not on faculty during our time). 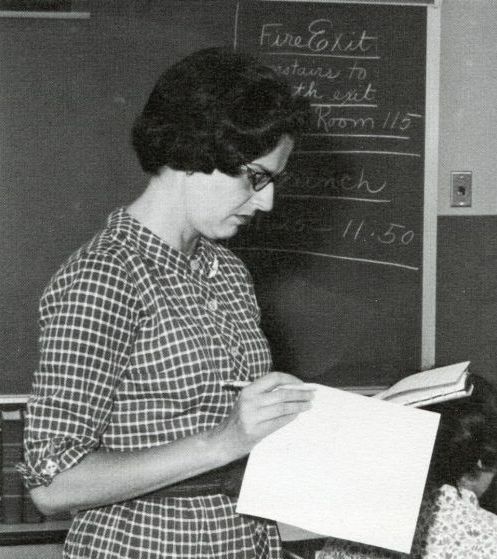 Twenty-nine years after we graduated, thirteen of our teachers were still at ELHS. 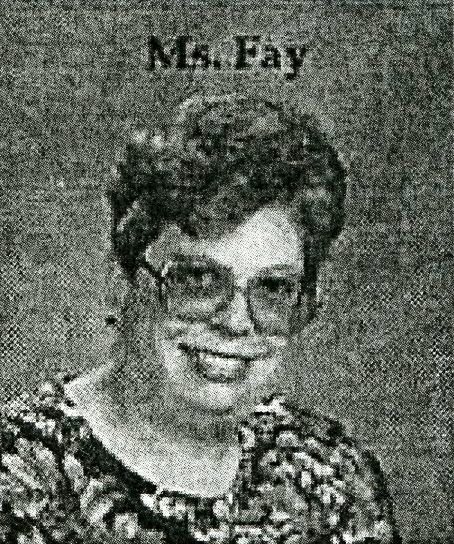 Here they are during the 1998-99 school year, courtesy of the 1999 yearbook. 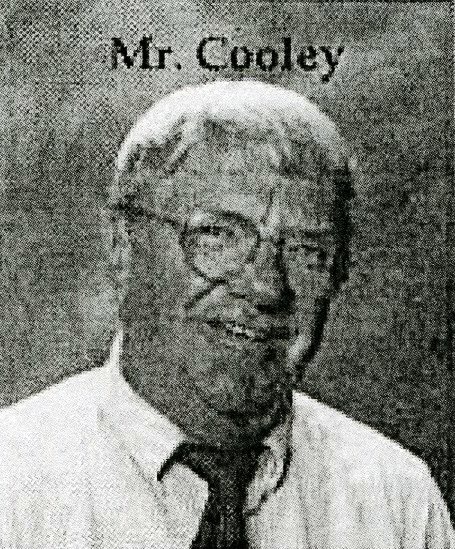 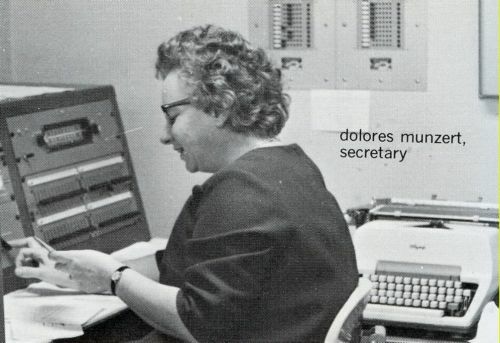 The yearbook choose to label all the female teachers "Ms."
Mr. Richard Bolles (physical education) --- retired in 2000; Mr. Ralph Cooley (business) --- retired in 2003; Mr. Dennis Dowling (foreign languages) --- retired in 2004; Miss Deborah Fay (foreign languages) --- retired in 2003. 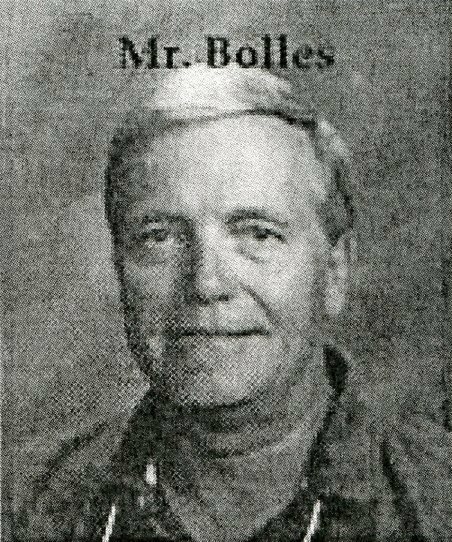 Following retirement, Mr. Bolles was inducted into the ELHS Athletic Hall of Fame. 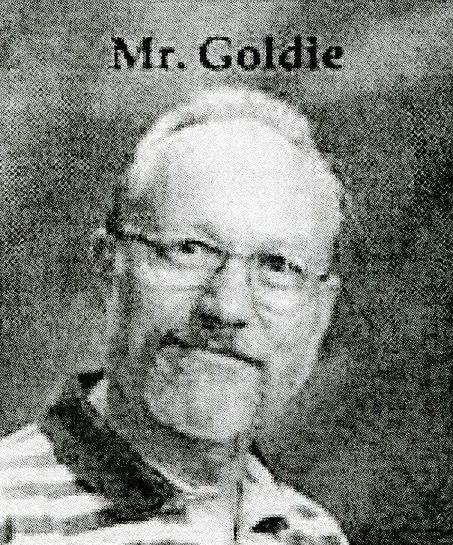 Mr. Richard Goldie (art) --- retired in 2002; Mrs. Susan Goldie (science) --- we knew her as Miss Susan Johnson --- retired in 2003; Miss Marina Herschuk (business) --- retired in 2000; Mr. Robert Mazzariello (assistant principal) --- English teacher during our time --- retired in 2000. 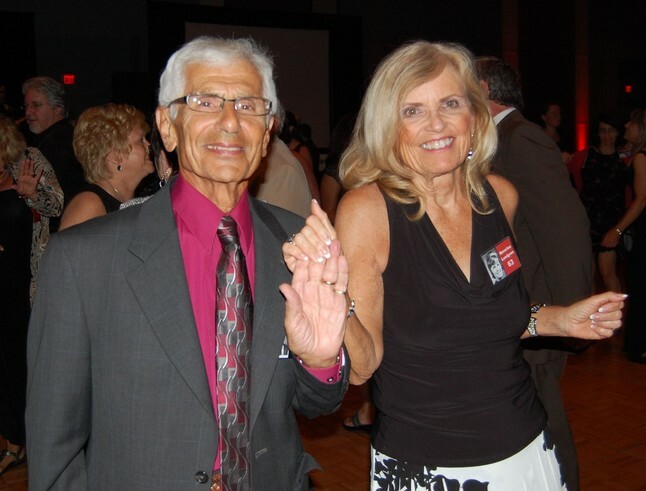 Following retirement, Mrs. Goldie and Mr. Mazzariello were inducted into the East Longmeadow Public School Educators Hall of Fame, and Mr. Mazzariello was also inducted into the ELHS Athletic Hall of Fame. 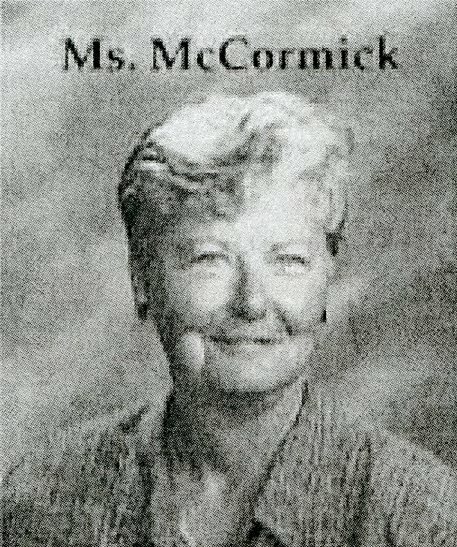 Mrs. Diane McCormick (guidance counselor) --- we knew her as math teacher Miss Diane Tarrant --- retired in 2004; Mr. Charles McKinney (English) --- retired in 1999; Mr. Edward Modzelewski (physical education) --- retired in 2000; Mr. Walter Porowski (mathematics) --- retired in 2002. 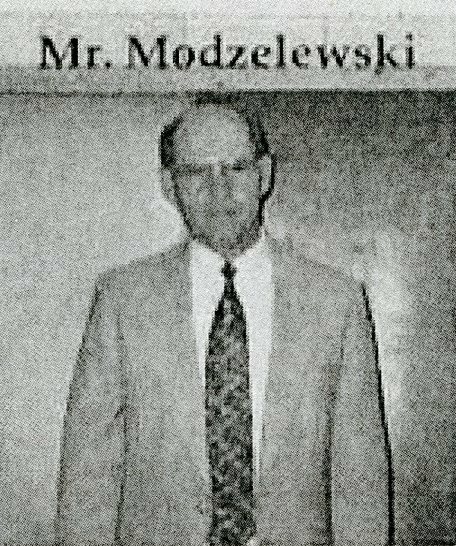 Following retirement, all four were inducted into the East Longmeadow Public School Educators Hall of Fame, and Mr. Modzelewski was also inducted into the ELHS Athletic Hall of Fame. 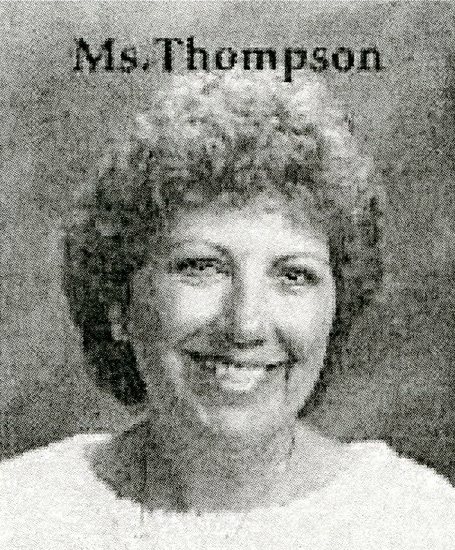 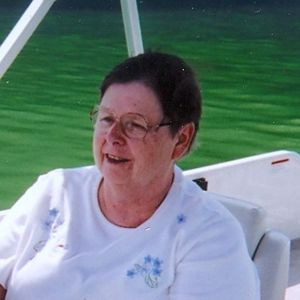 Mrs. Christine Thompson (foreign languages) --- we knew her as Mrs. Christine Manville --- retired in 1999. 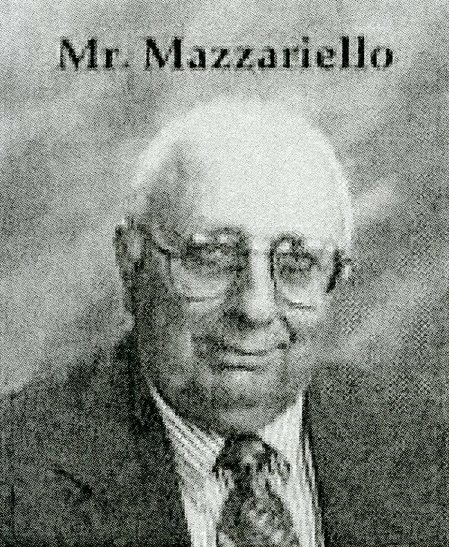 Here are some photos of our teachers and staff from 2000 to the present. 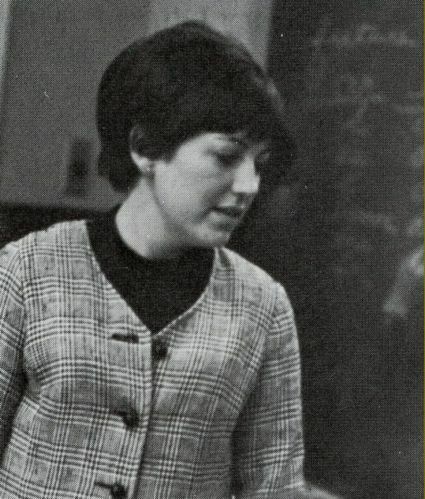 Many of them also appear on the ELHS 50th Birthday page. 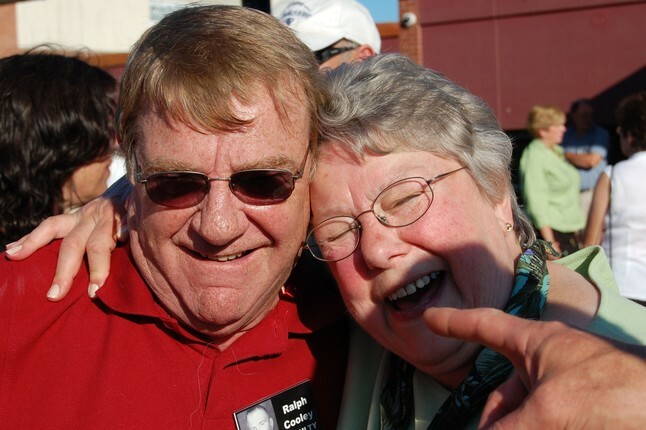 We hope they bring back fond memories. 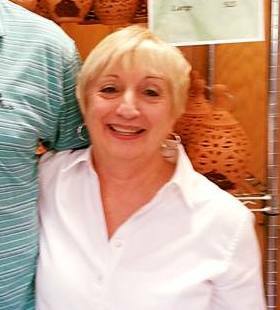 Photos courtesy of classmate Donna Anderson unless otherwise indicated. 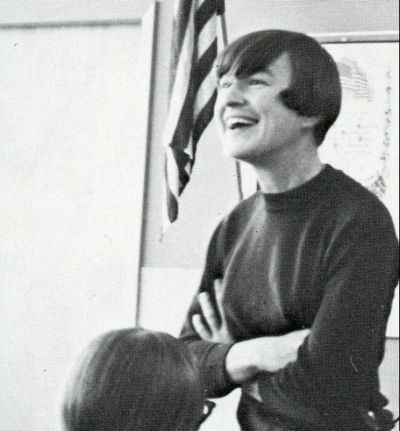 English teacher Mrs. Dorothy Allard with Jim Mayher, ELHS 1971, in Mrs. Allard's apartment, around 2004. 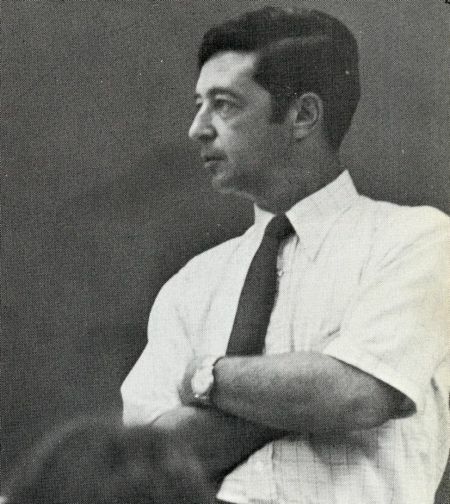 Photo courtesy of Jim Mayher. 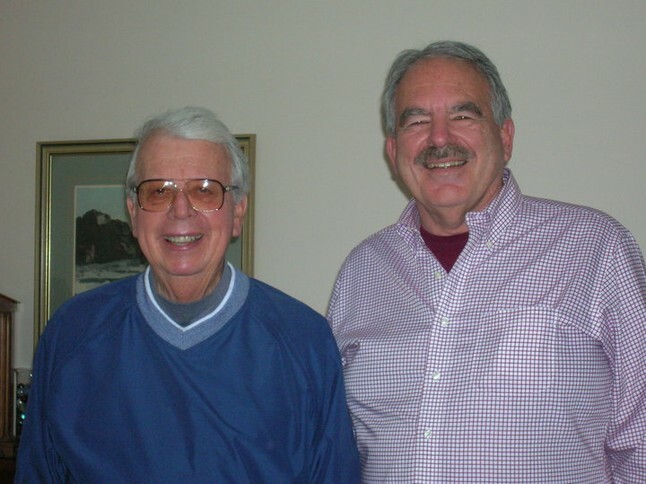 Our principal, Mr. Ralph Shindler, and our assistant principal, Mr. Manley Hart in 2006. 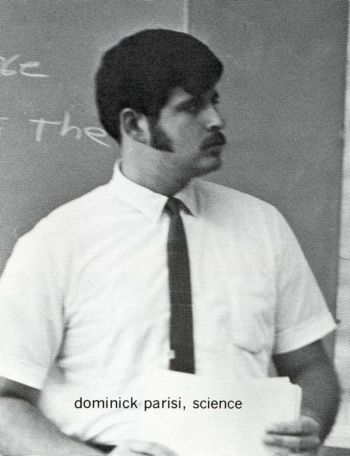 Photo courtesy of Dennis Dowling. 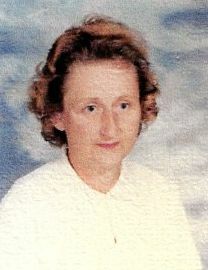 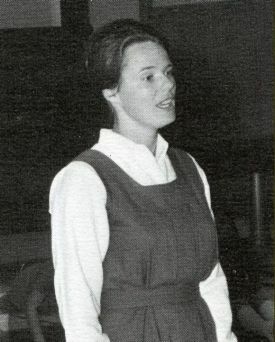 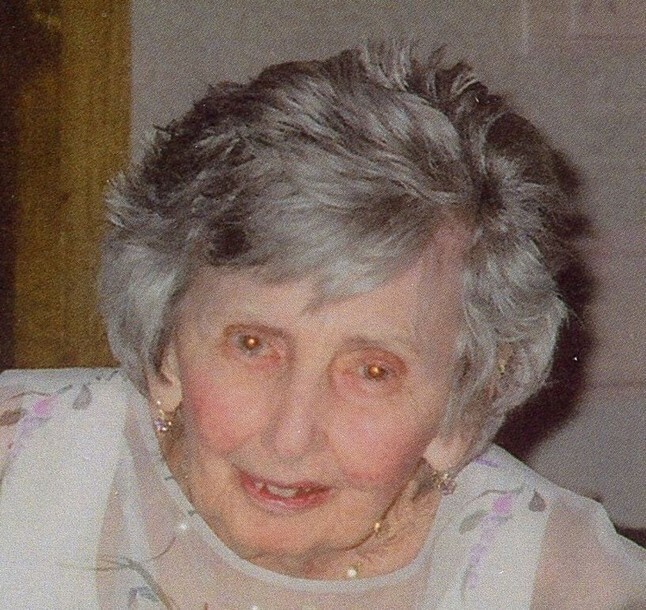 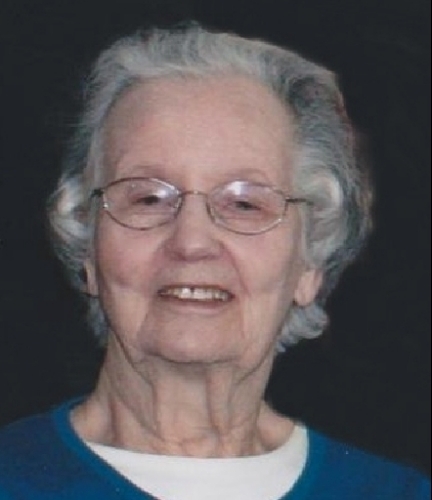 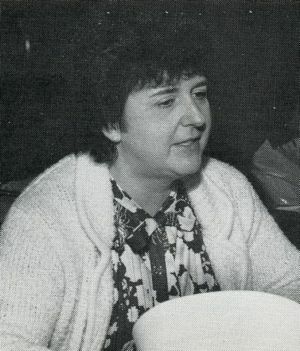 Vocal music teacher Mrs. Margaret "Jean" Corliss in 2007. 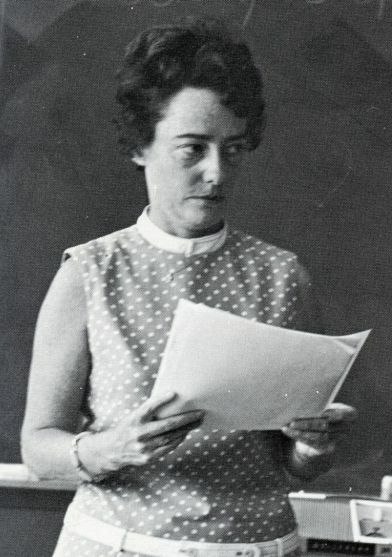 Photo courtesy of her daughter, Margaret Corliss Byrne. 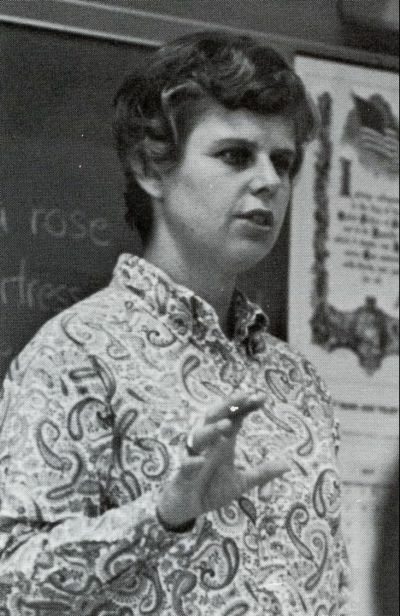 English teacher Miss Joan Bereswill, around 2007. 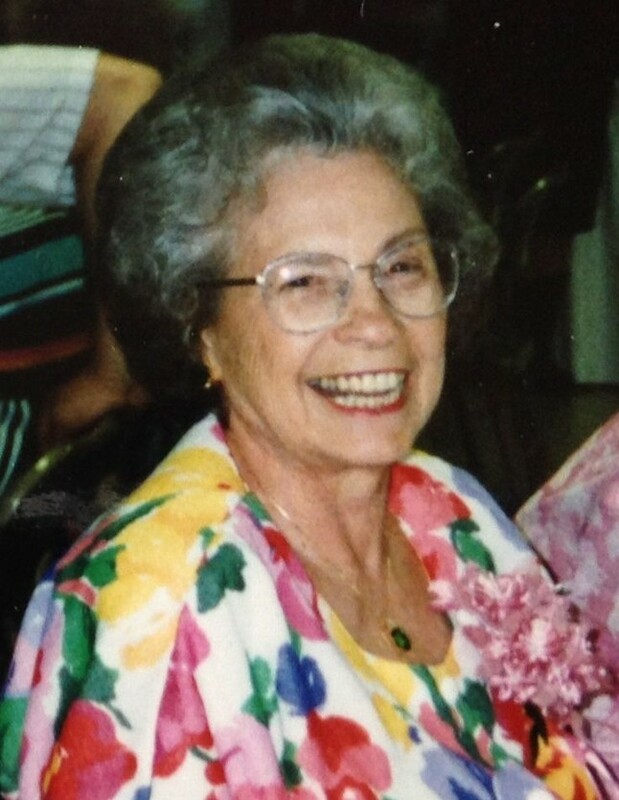 Photo courtesy of her cousin, Robert Finer. 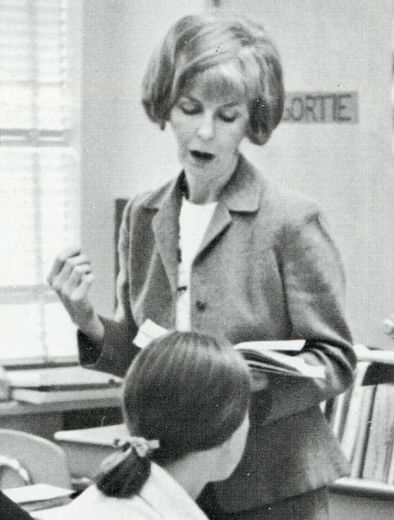 Left: English teacher Mrs. Ella Richter, whom we knew as Mrs. Ella LaBarre, in 1998 while she was teaching in Oklahoma. 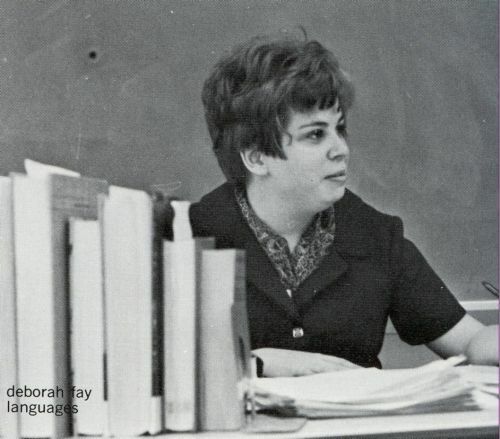 After her time at ELHS, Mrs. LaBarre married Mr. Daryl Richter, who joined the ELHS faculty as a science teacher in our senior year. 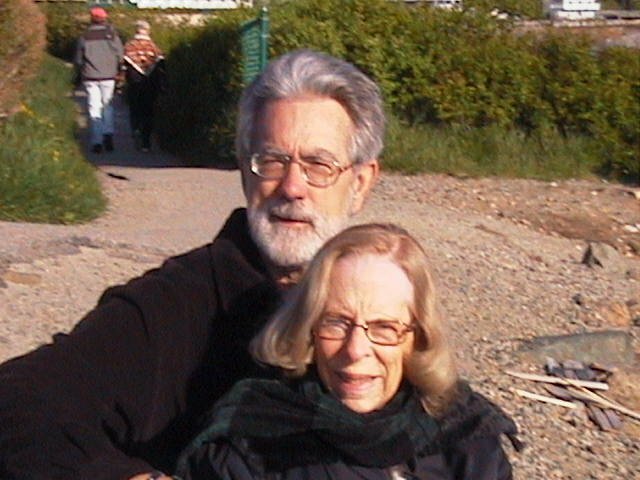 Right: Mr. and Mrs. Richter in Maine in 2010. 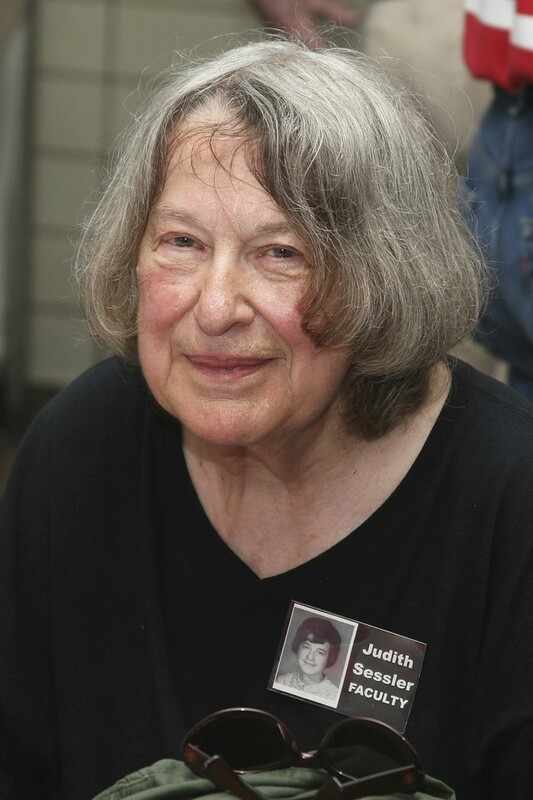 Photos courtesy of Daryl Richter. 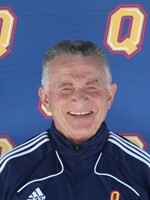 Mr. Robert Vespaziani, our football coach for our first three years, is pictured here in 2010 in his role as a coach for the Queen's University Gaels football team. 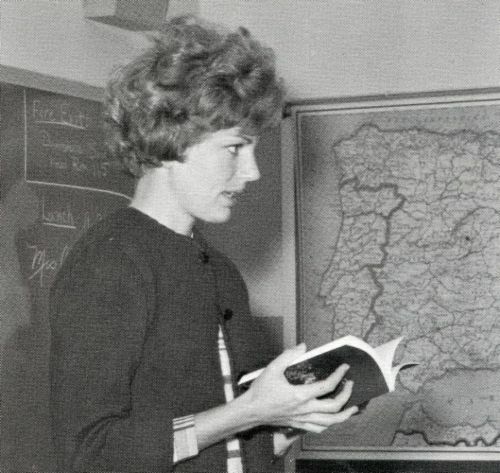 Queen's University is located in Kingston, Ontario, Canada. 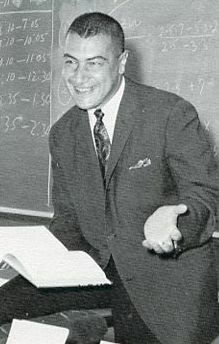 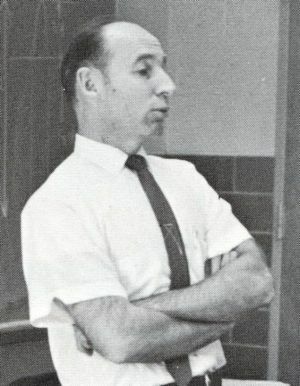 Following his time at ELHS, Coach Vespaziani moved to Canada, and continued coaching college and Canadian Football League teams, retiring in 2011 after a 51 year coaching career. 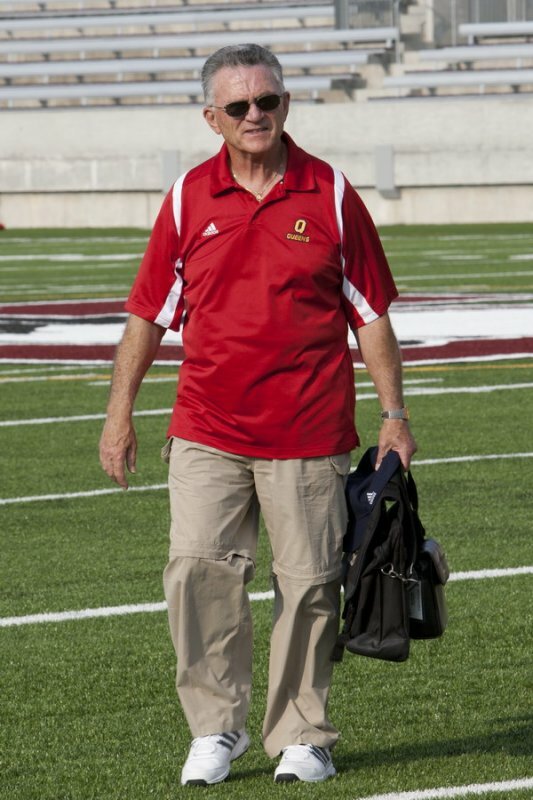 He then resumed coaching for the 2013-14 season as defensive line coach for the Queen's University football team. 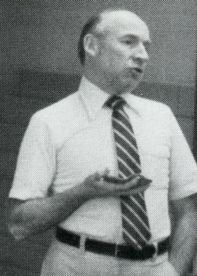 Photo courtesy of Jeff Chan. 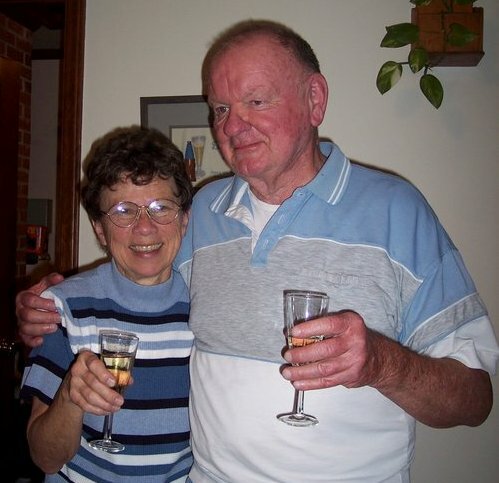 Science teacher Mr. Lloyd Dale and his wife, Nancy in 2010. 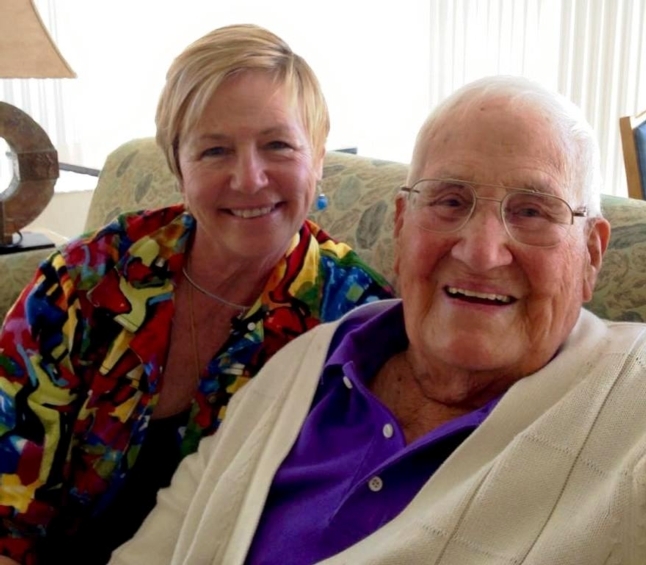 Teachers Miss Judith Sessler (English), Mrs. Marina Herschuk Luff (home economics) and 94-year-old Mr. Alexander Nickett (foreign languages) in July 2011. 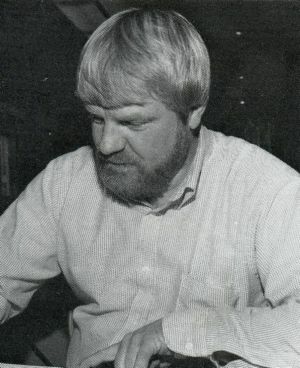 Photo on left courtesy of George Skovera of The Reminder. 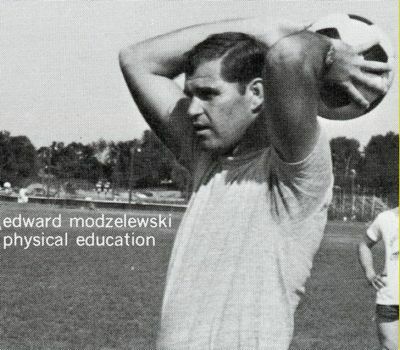 Teachers Mr. John Cheney (music) and Mr. Edward Modzelewski (physical education) in July 2011. 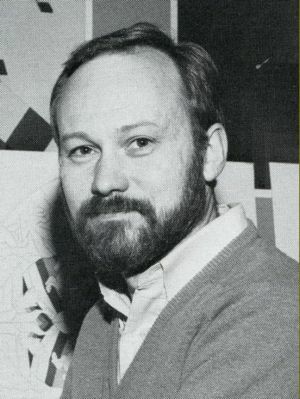 Photo on right courtesy of George Skovera of The Reminder. 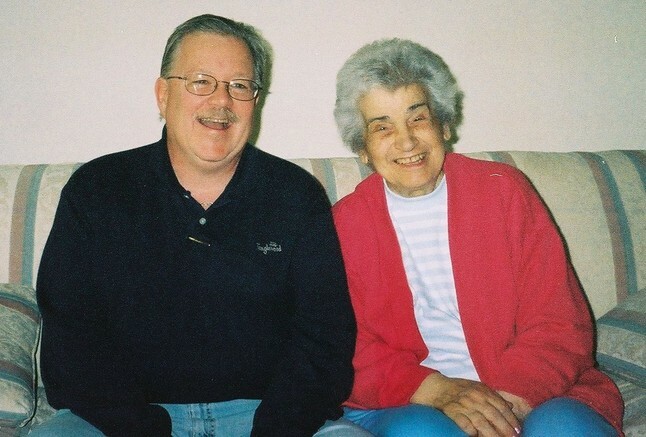 Teachers Mr. Ralph Cooley (business)and Miss Doris Knechtel (home economics) in July 2011. 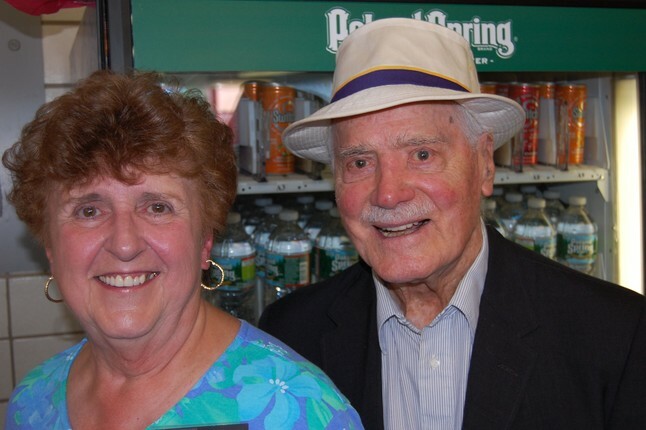 Assistant principal Mr. Manley Hart, and assistant principal and science teacher Mr. John Katsoulis and his wife, Beverlee in July 2011. 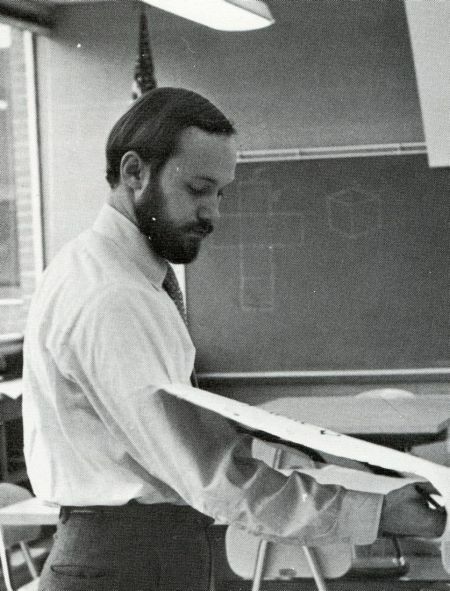 Math teacher Mr. Francis Dutille, and English teacher Mr. Bob Mazzariello with Laura Moore, ELHS 1974 in July 2011. 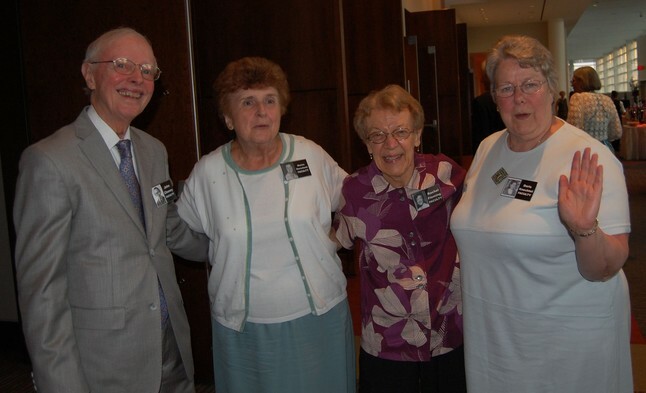 Teachers Mr. John Cheney (music), Mrs. Marina Herschuk Luff (business), Mrs. Rachel Fleming (foreign languages), and Miss Doris Knechtel (home economics) in July 2011. 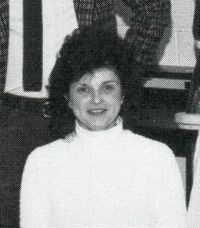 Teachers Mrs. Anita Katseoris Themistos (English) and Mr. Richard Bolles (physical education) in July 2011.
Business teachers Mr. Joseph St. Germain and Mr. Ralph Cooley in July 2011. 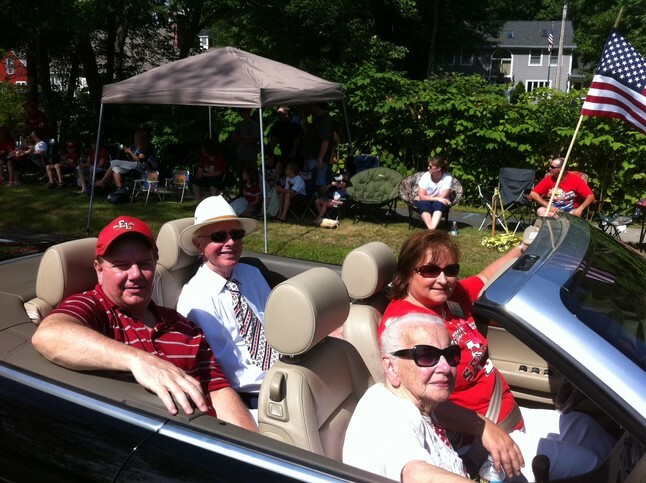 Librarian Mrs. Ann Lynch (front seat in white), and music teacher Mr. John Cheney (back seat in white) in July 2011. 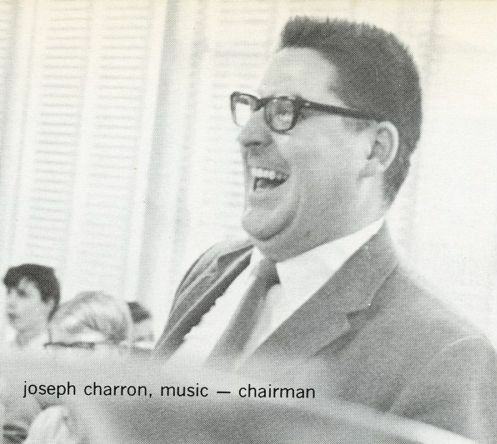 Photo courtesy of Roy Esposito. 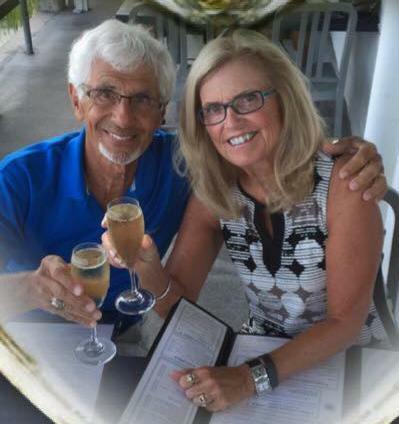 Social studies teacher Mr. Ronald Lech and his wife, Mrs. Judi Gallant Lech, who taught us social studies at Birchland Park School, in July 2011. 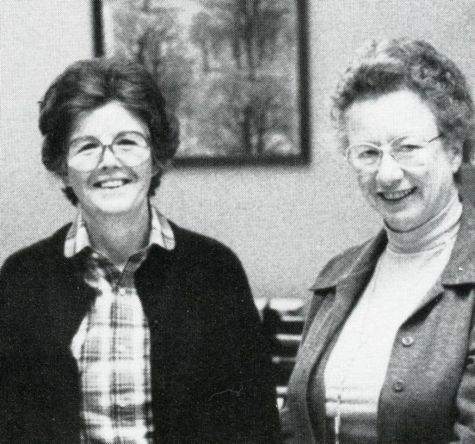 In 2011, science teacher Mrs. Susan Goldie, second from left, who we knew as Miss Susan Johnson, and math teacher Mr. Walter Porowski, far right, were inducted into the East Longmeadow Public Schools Educators Hall of Fame. 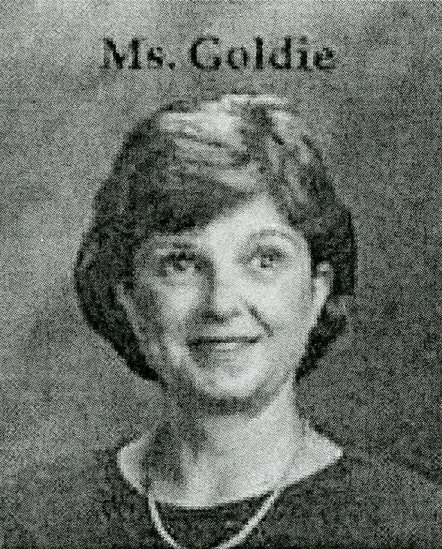 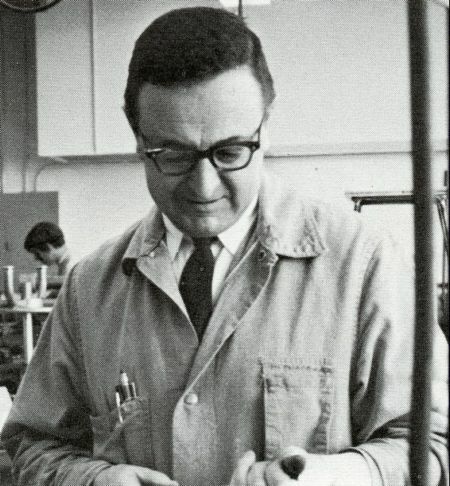 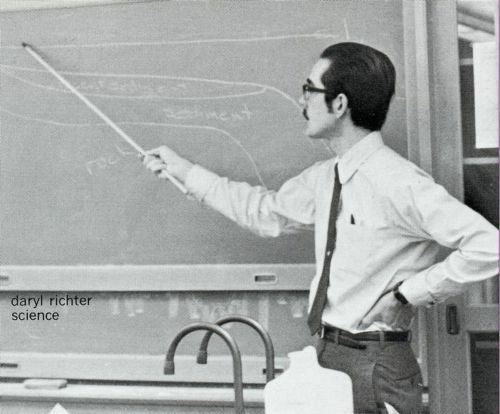 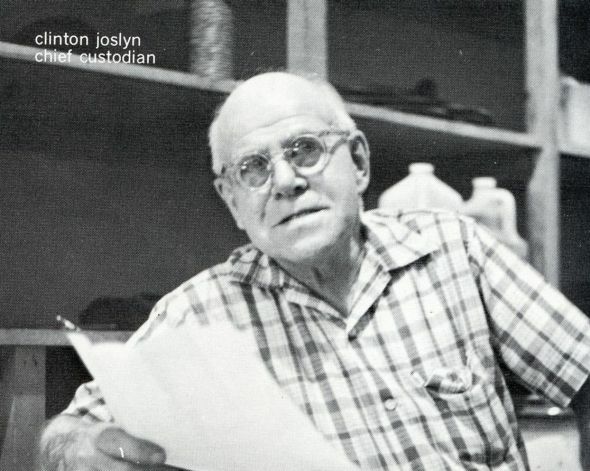 After we graduated, Miss Johnson married art teacher Mr. Richard Goldie. 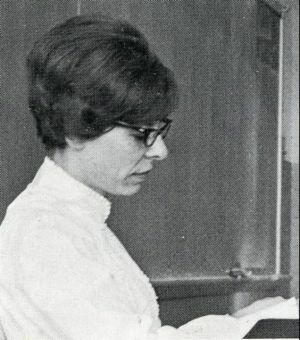 Photo courtesy of Veronica Richter. 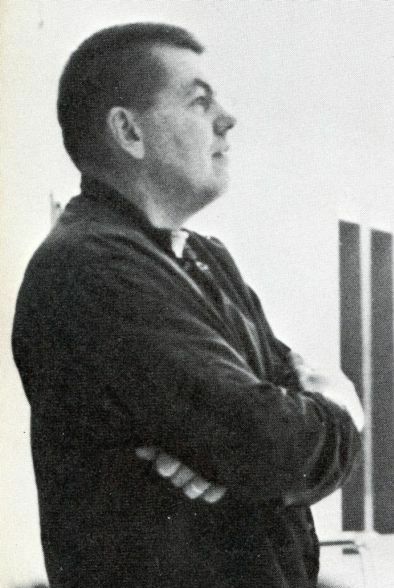 Industrial arts teacher and basketball coach Mr. William Reagan, seen here in Feb. 2012 in his role as girls' varsity basketball coach at East Lyme High School, East Lyme, CT. During our time at ELHS Mr. Reagan was the boys' varsity basketball coach during our sophomore, junior, and senior years. 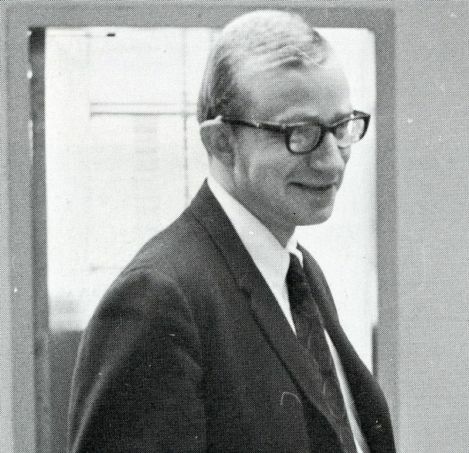 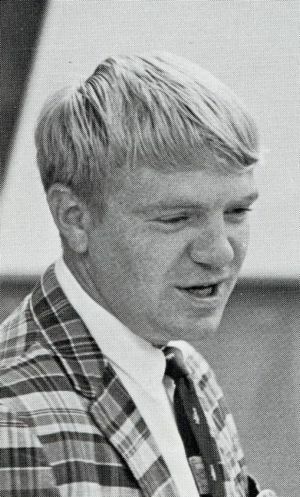 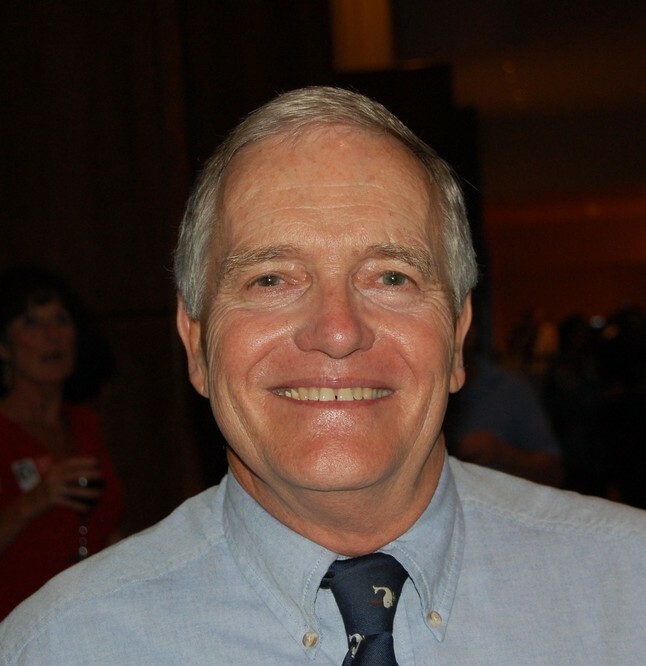 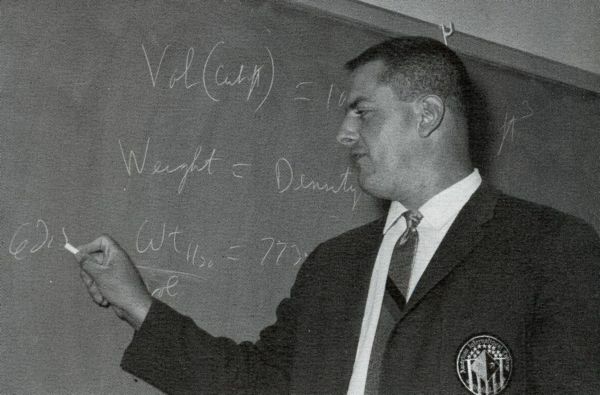 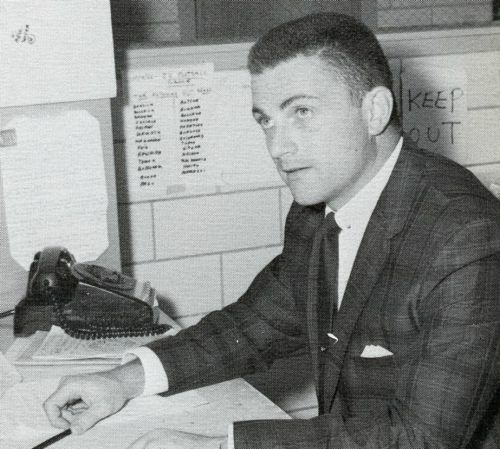 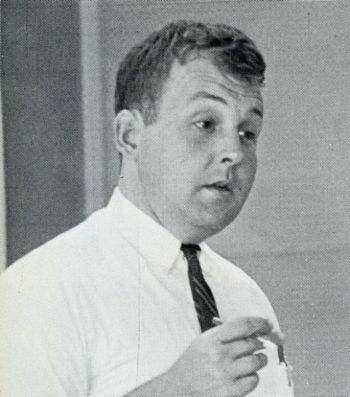 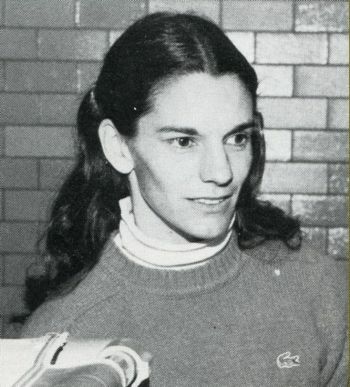 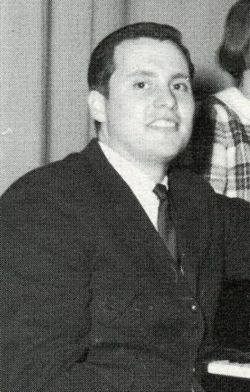 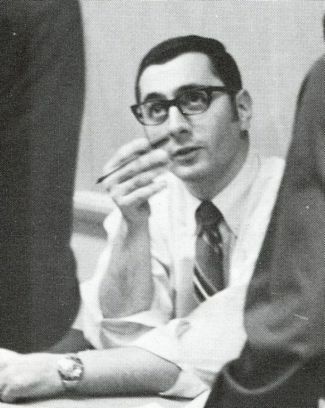 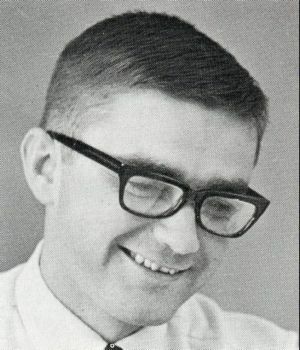 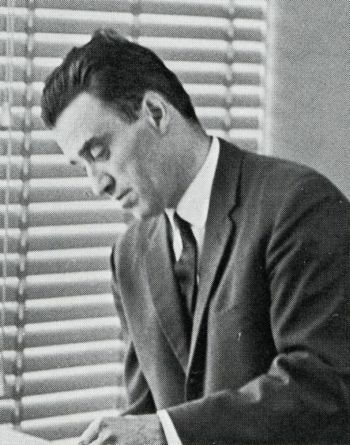 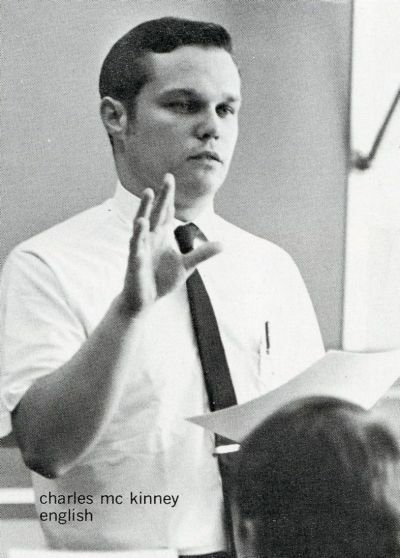 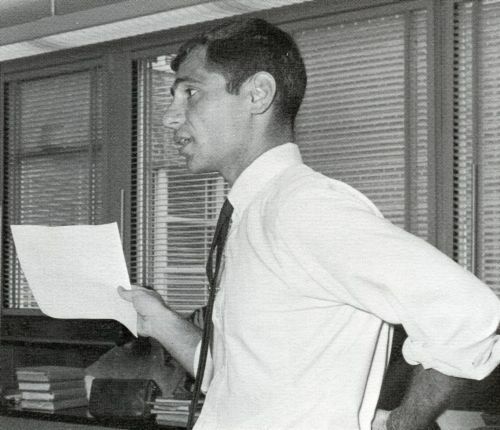 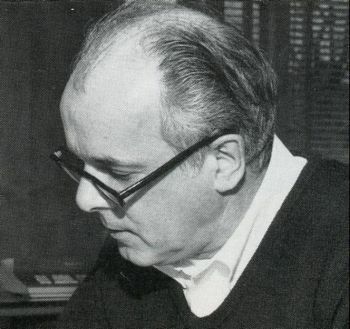 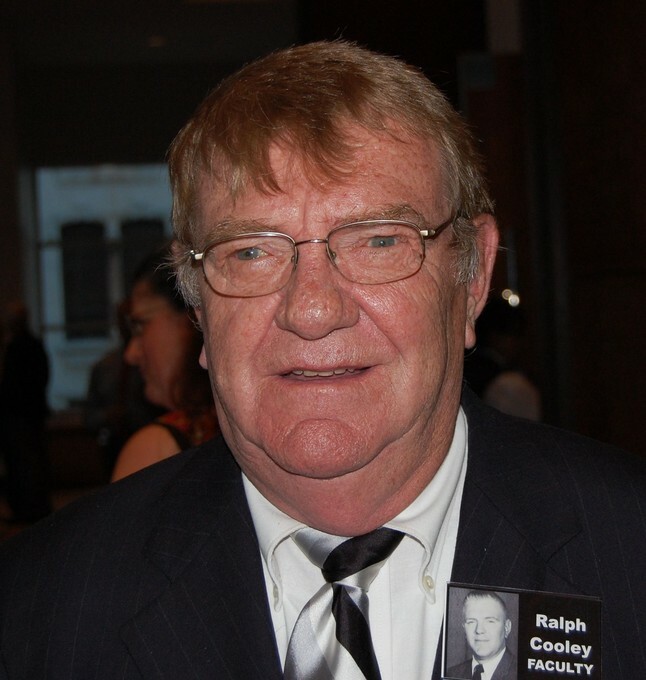 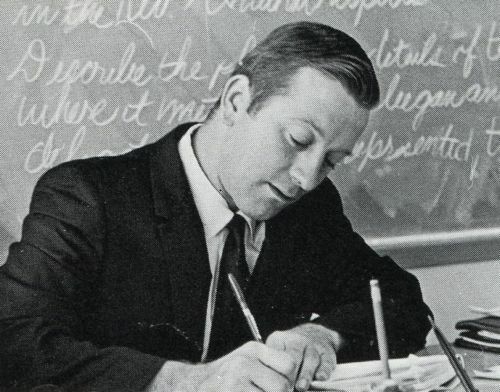 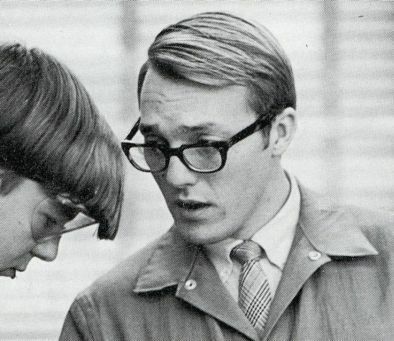 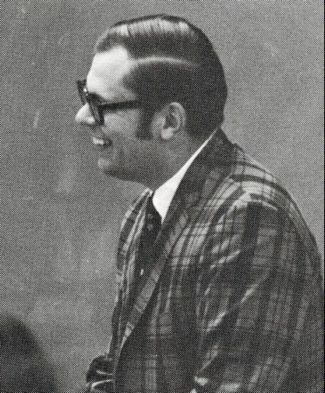 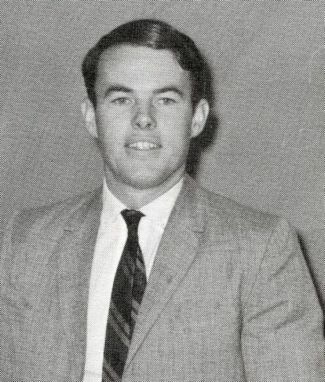 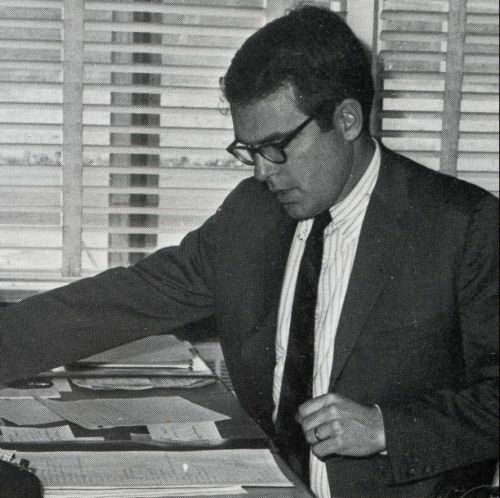 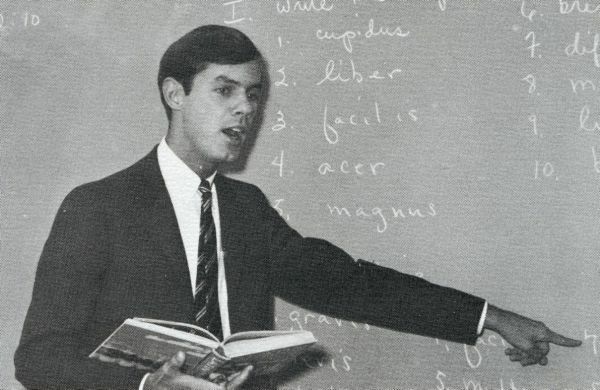 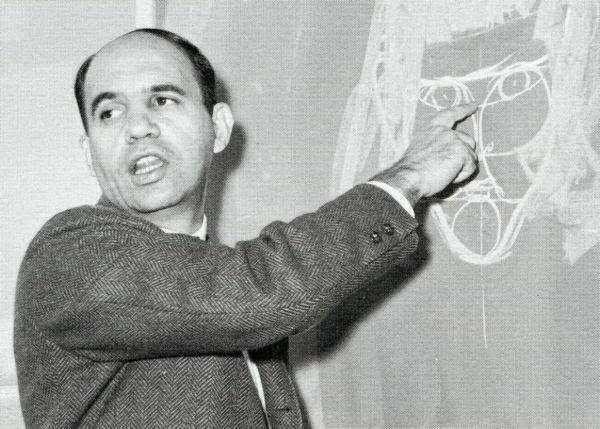 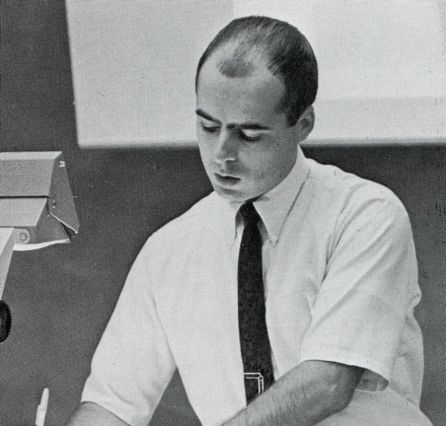 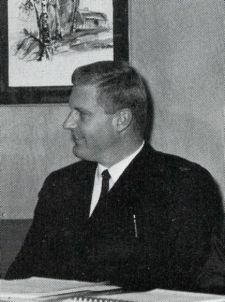 After leaving ELHS in 1970, he continued coaching at several high schools in Connecticut. 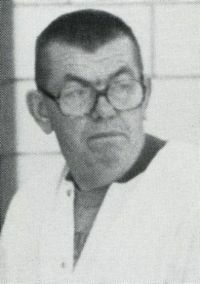 From 2000-2009 he coached the Finnish and Irish women's national basketball teams in Europe. 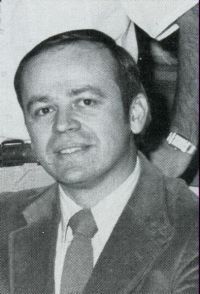 In 2006 he was inducted into the New England Basketball Hall of Fame. 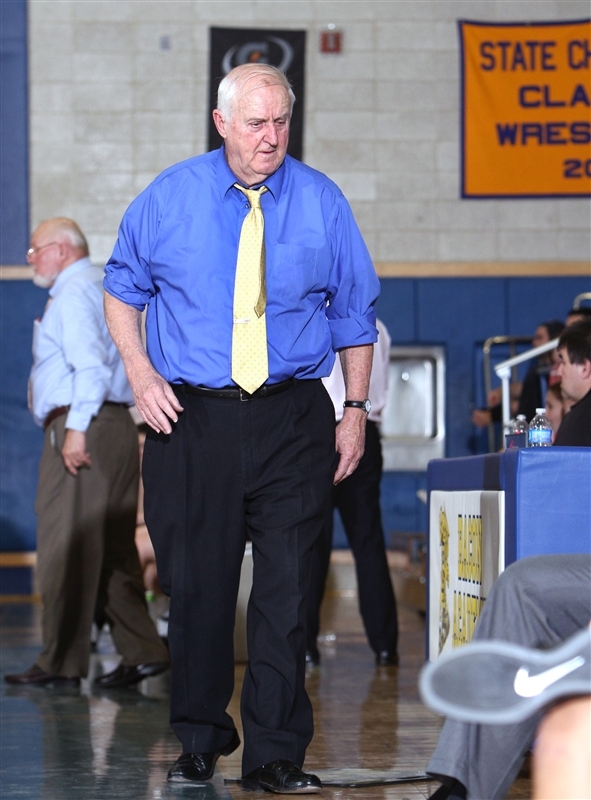 Photo courtesy of maxpreps.com. 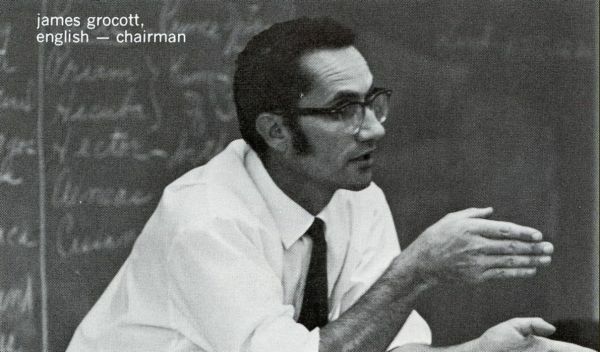 Foreign languages teacher Mr. Dennis Dowling, right, with Scott Moore, in May 2012. 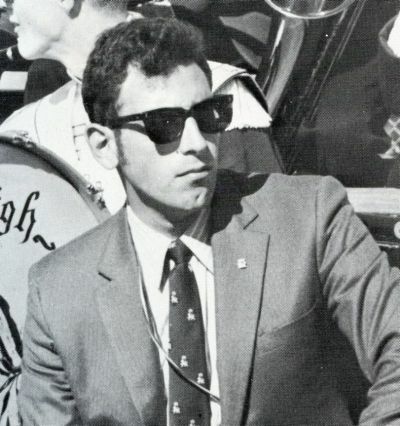 Dennis was touring northern California. 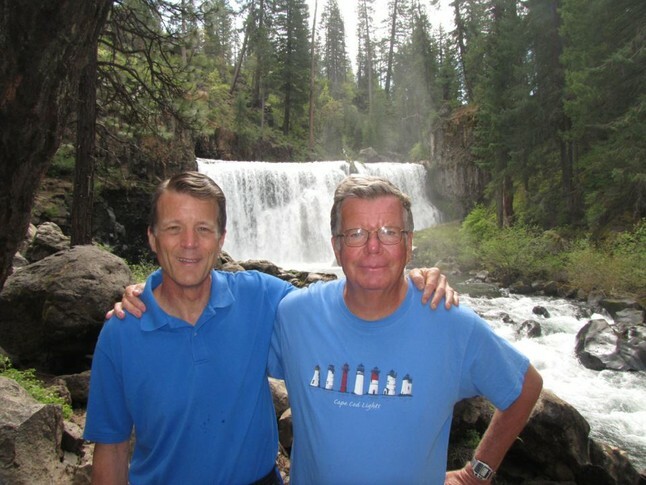 In the background are the Middle Falls of the McCloud River, near Scott's home. 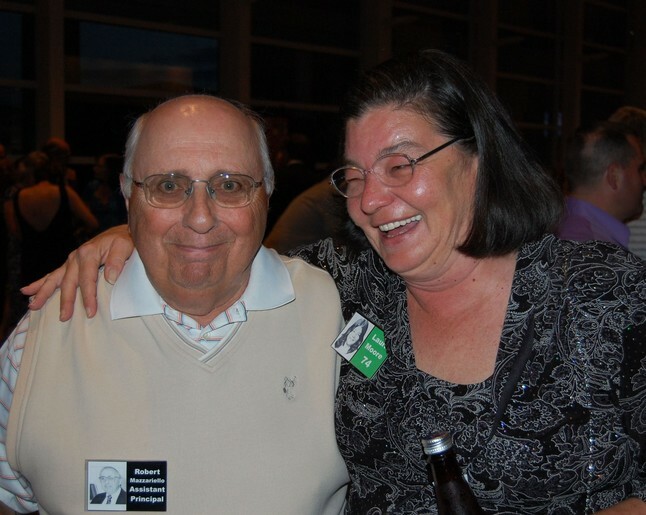 Photo courtesy of Dennis Dowling. 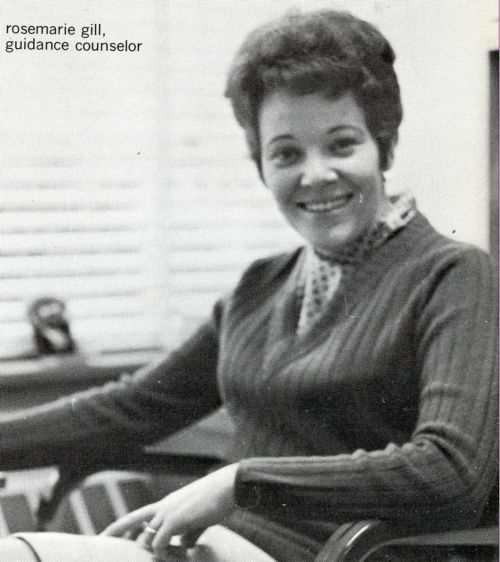 Guidance counselor Mrs. Irene Liana in 2012. 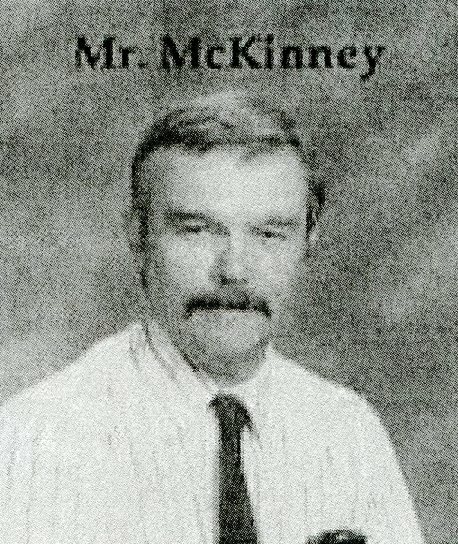 Science teacher Mrs. Kristine Shonak Garner in August 2012. 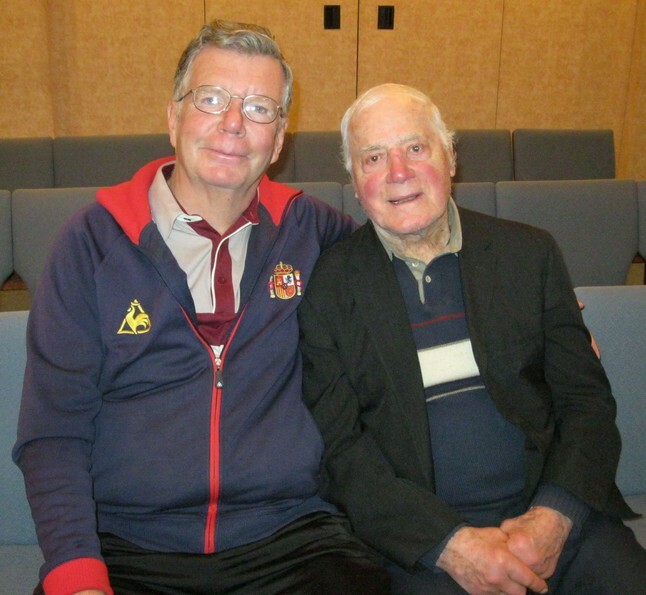 Foreign languages teachers Mr. Dennis Dowling and 95-year-old Mr. Alexander Nickett during the Celebration of Life remembrance for Mrs. Rachel Fleming on Jan. 12, 2013. 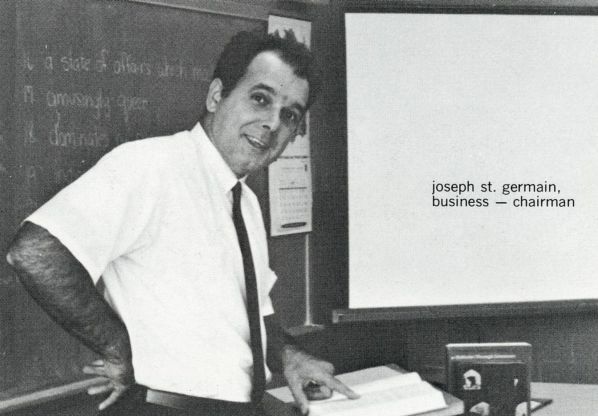 Photo courtesy of Mr. Dowling. 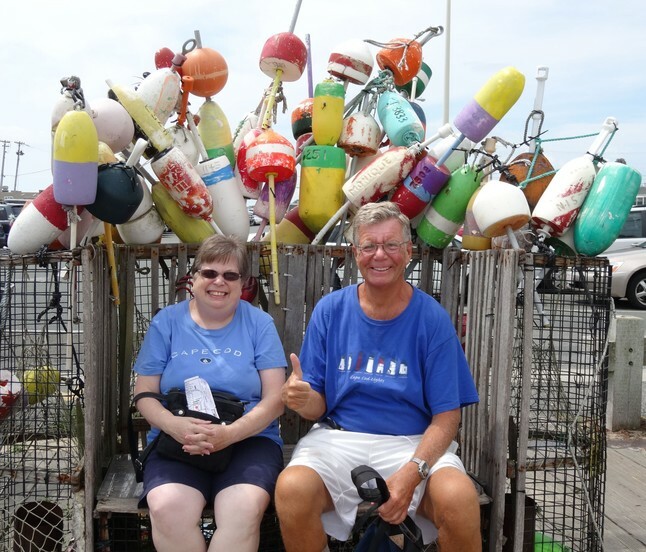 Foreign languages teachers Miss Deborah Fay and Mr. Dennis Dowling in Provincetown, MA, in July 2013. 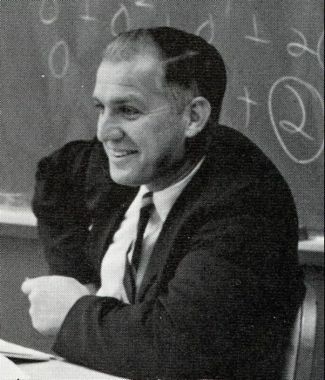 Photo courtesy of Mr. Dowling. 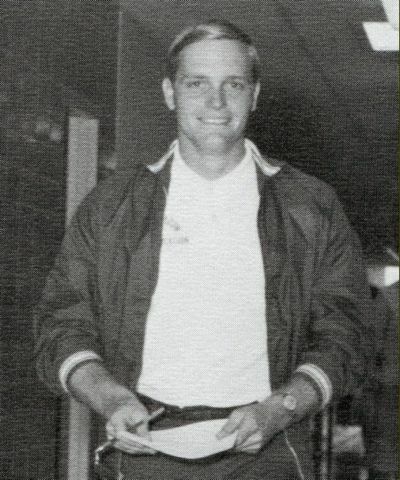 Mr. Robert Vespaziani, our football coach for our first three years, in 2013. 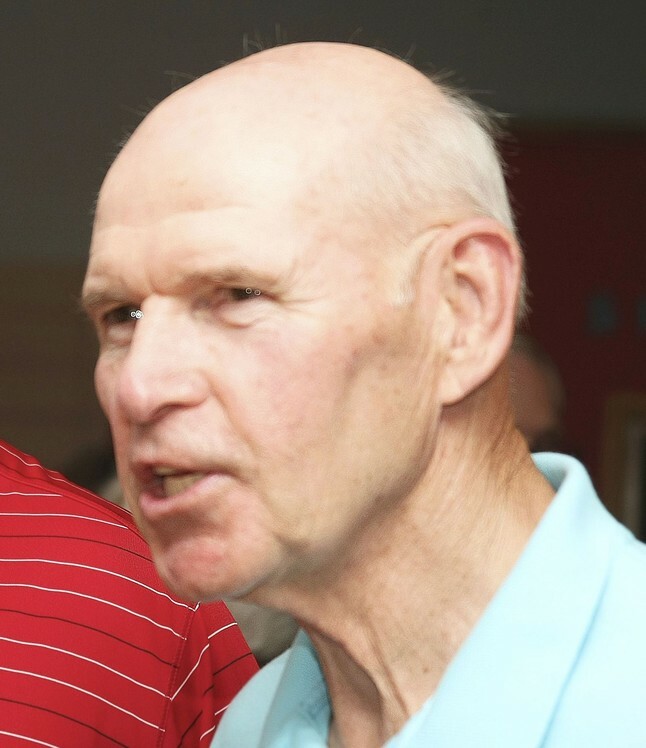 After a 51-year career coaching football, he retired in 2011, only to return as defensive coach of the Queen's University, Ontario, Canada football team for the 2013 season. 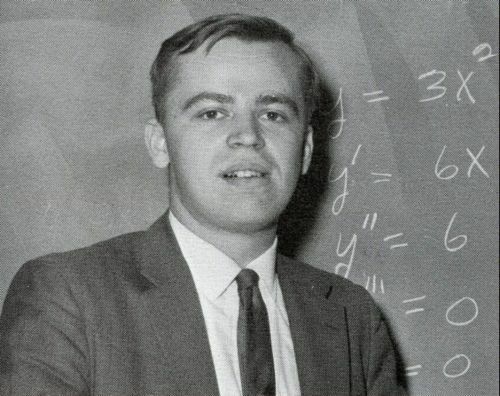 Photo courtesy of Queen's University. 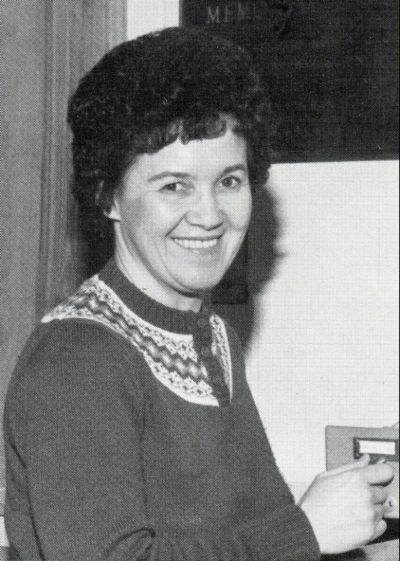 Miss Janet Kerr, physical education coach and instructor from 1969-1988, following her induction into the ELHS Athletic Hall of Fame on Nov. 23, 2013. 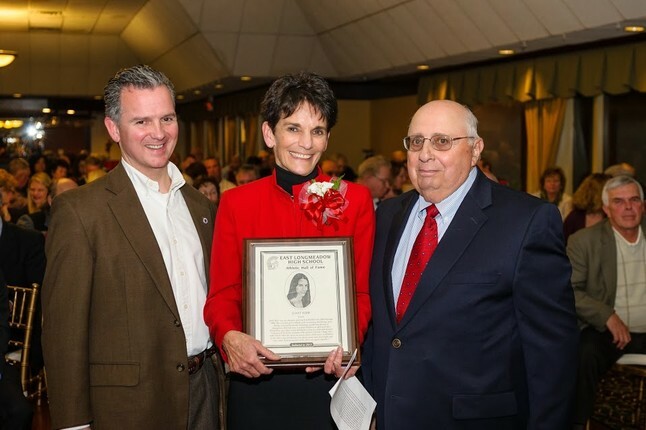 Left to right: Mr. Brian Ashe, 2nd Hampden District representative in the Massachusetts House of Representatives; Miss Kerr; and Mr. Bob Mazzariello, one of our English teachers and president of the ELHS Athletic Hall of Fame. 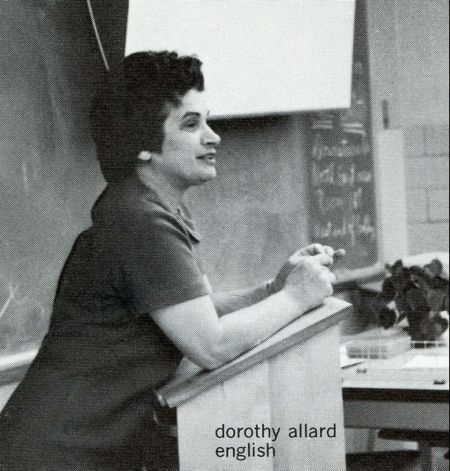 Photo courtesy of Bill Sharon (ELHS 1973). 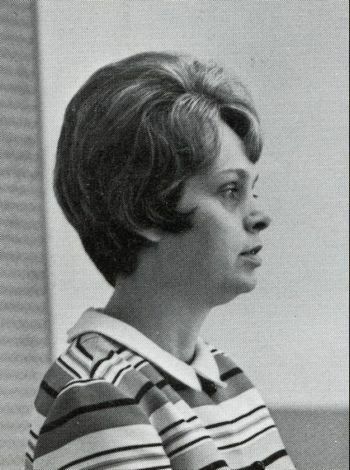 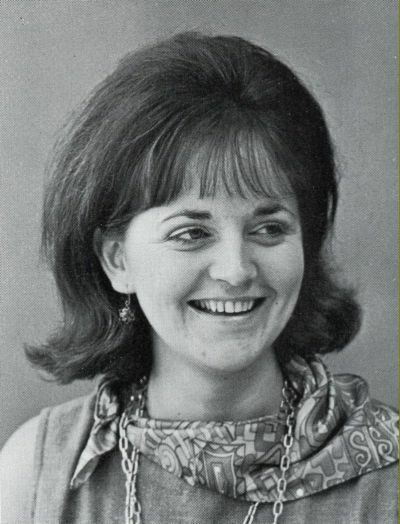 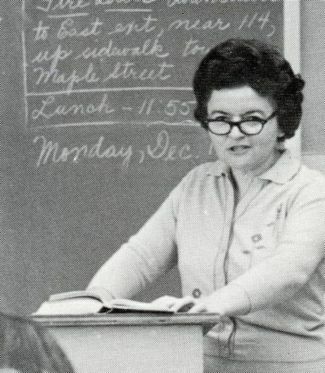 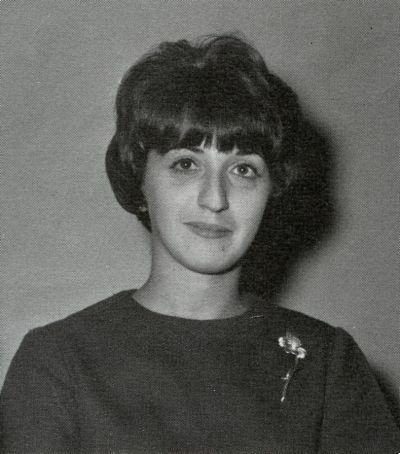 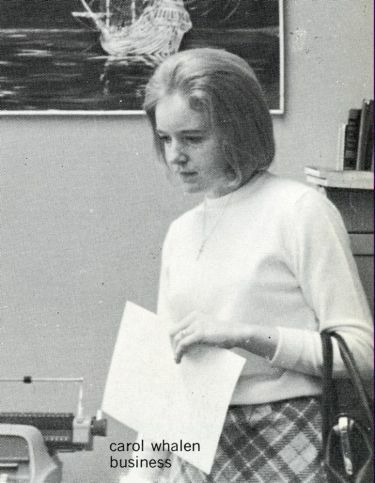 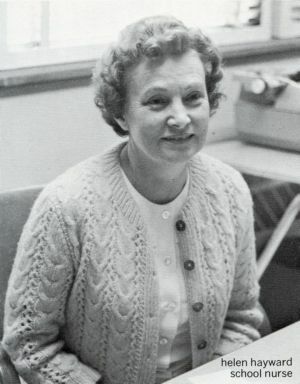 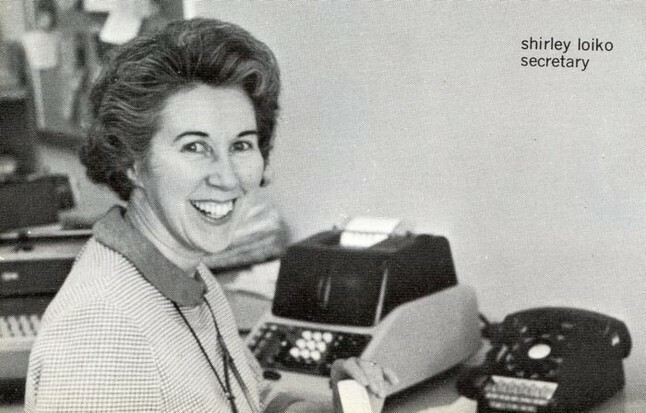 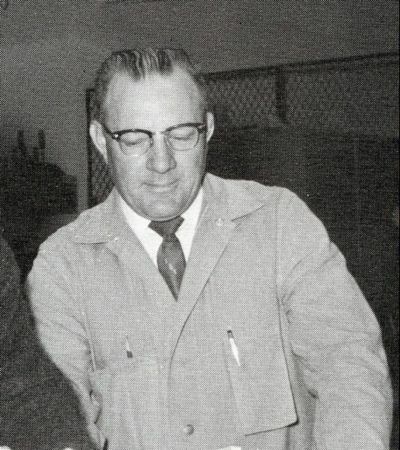 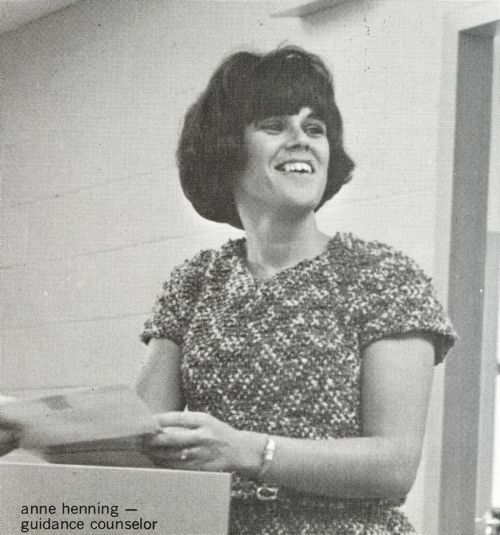 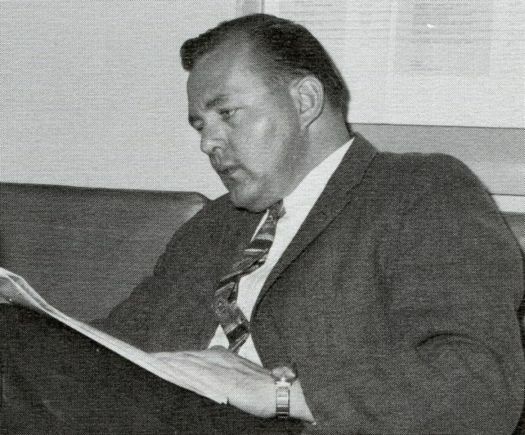 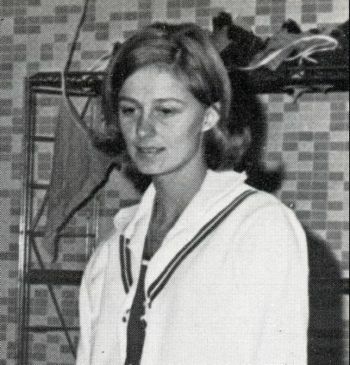 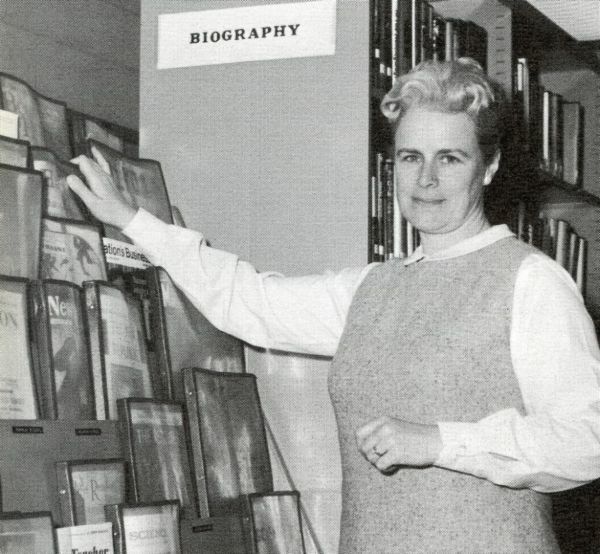 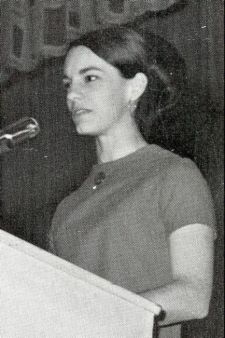 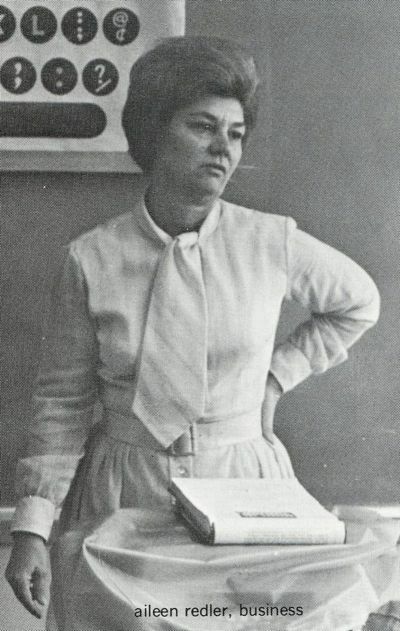 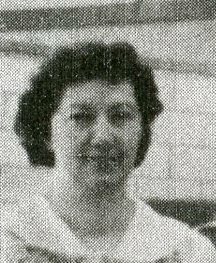 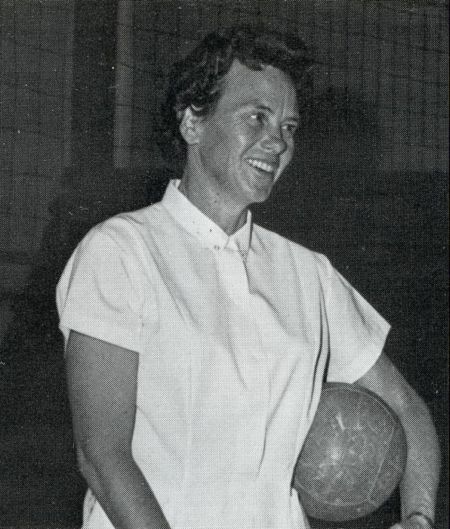 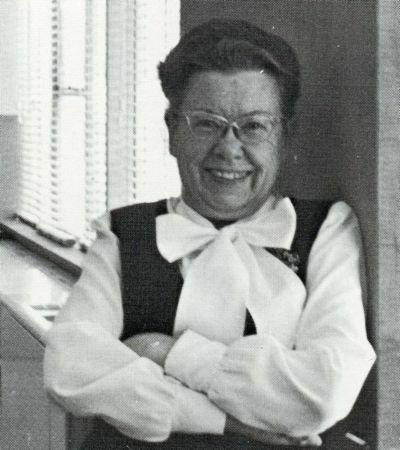 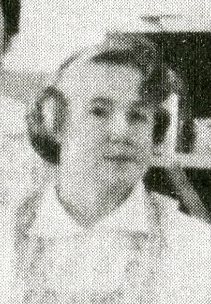 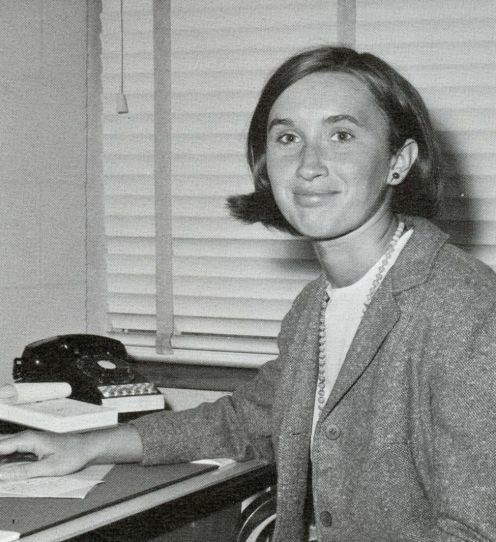 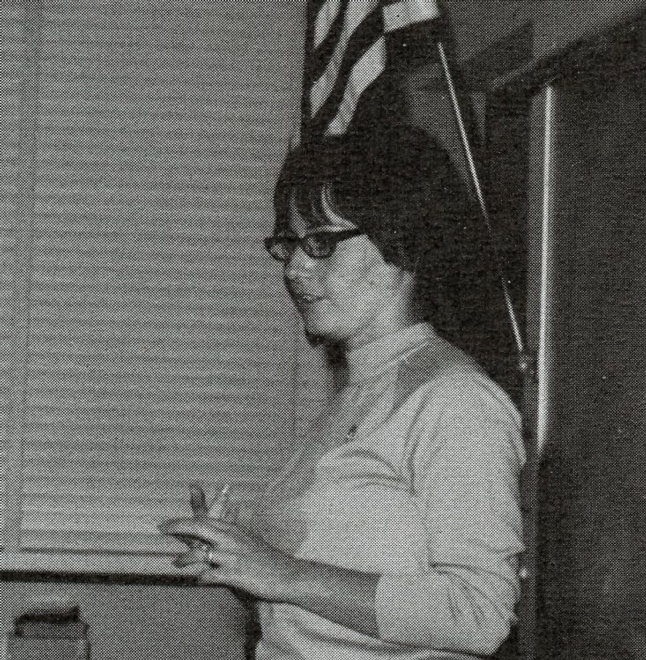 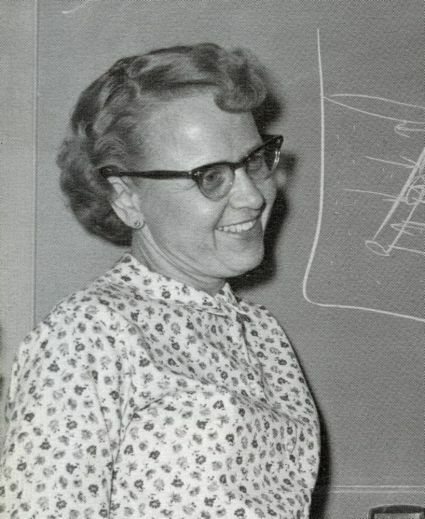 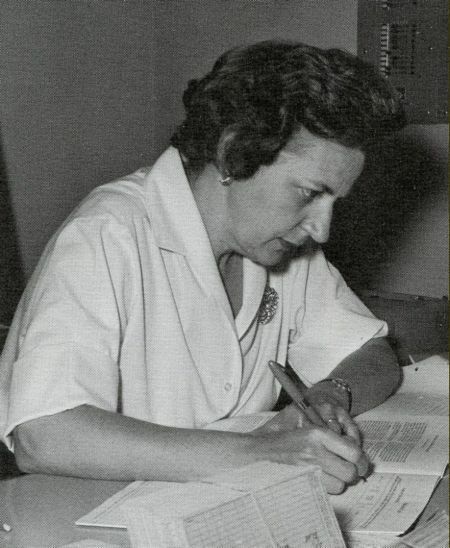 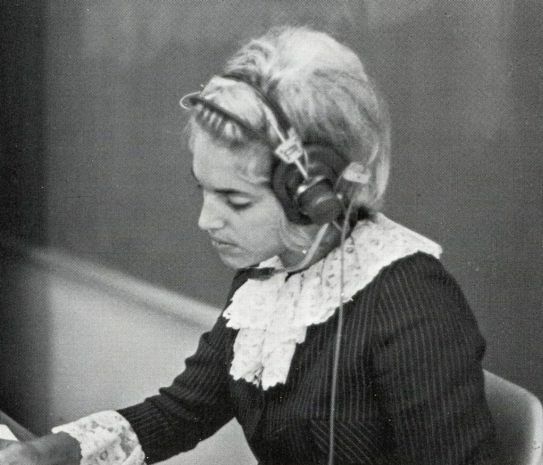 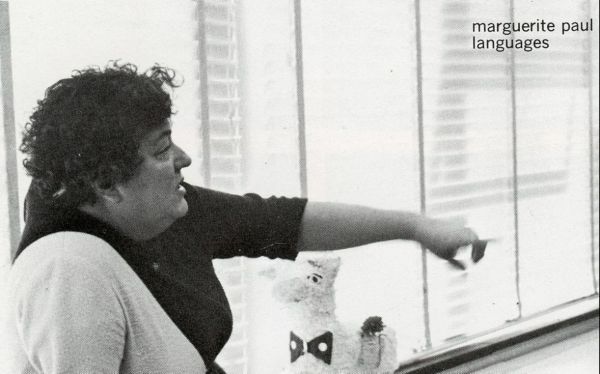 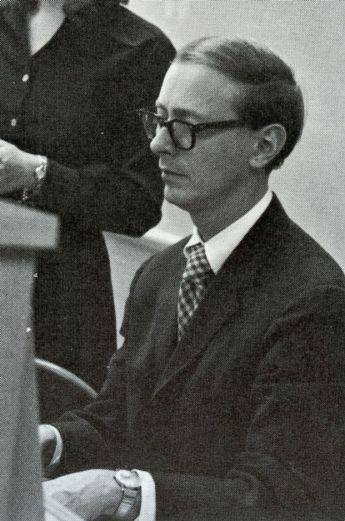 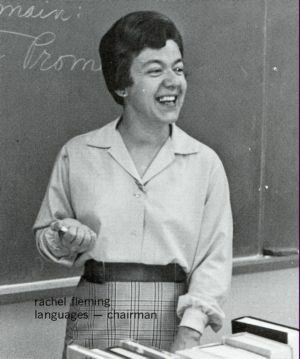 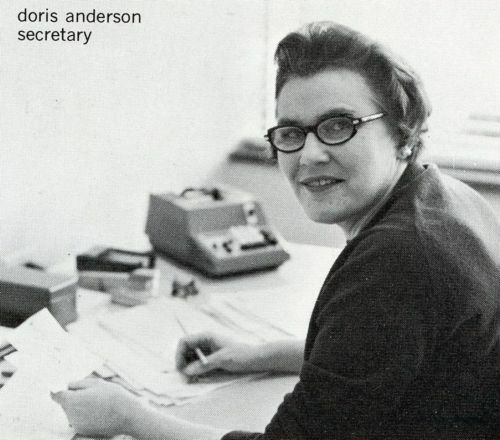 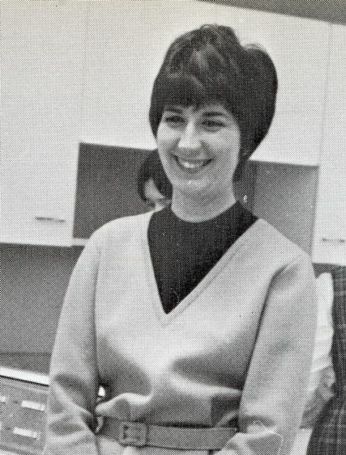 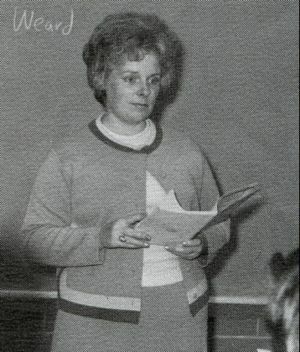 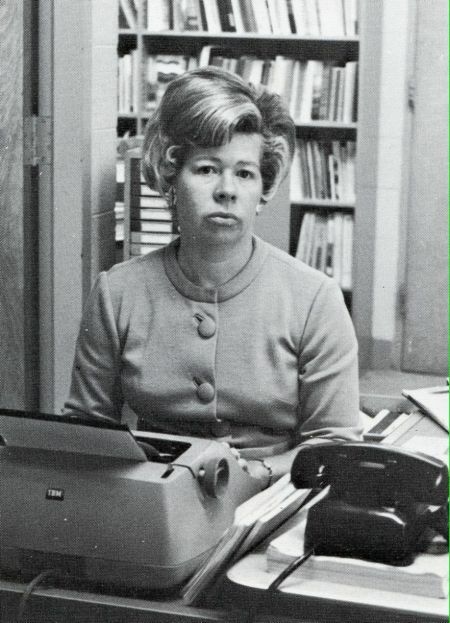 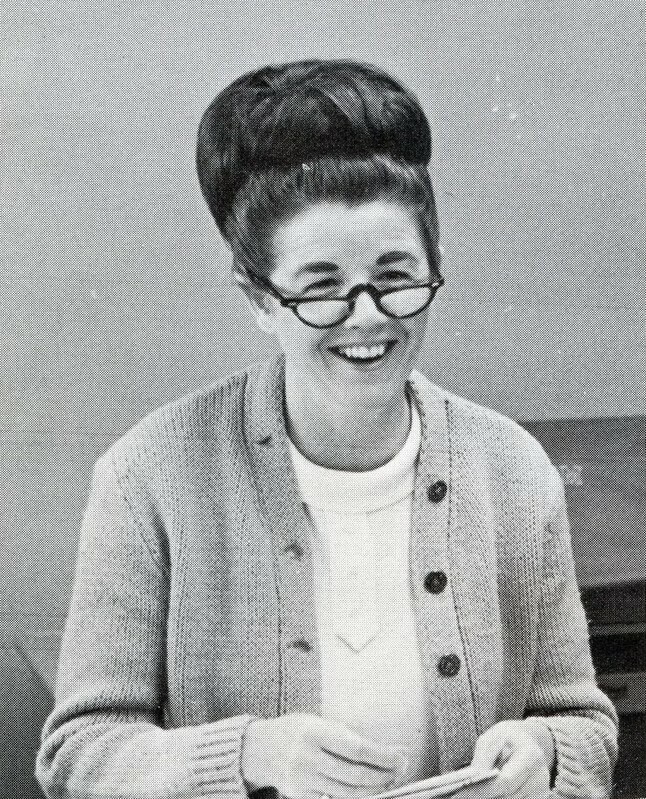 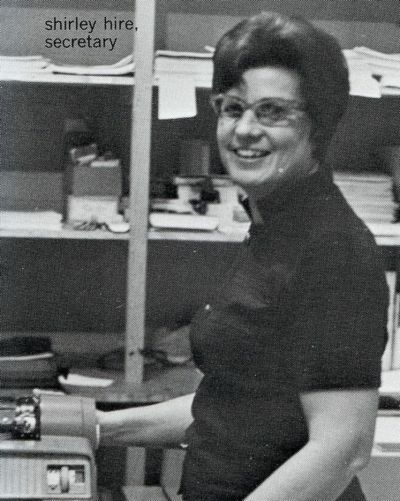 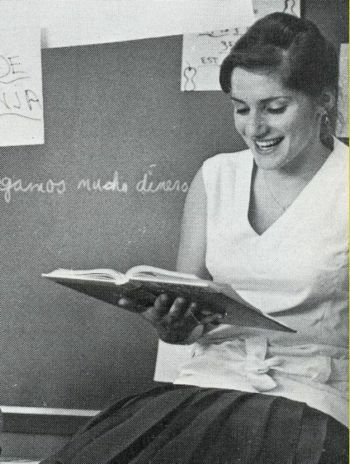 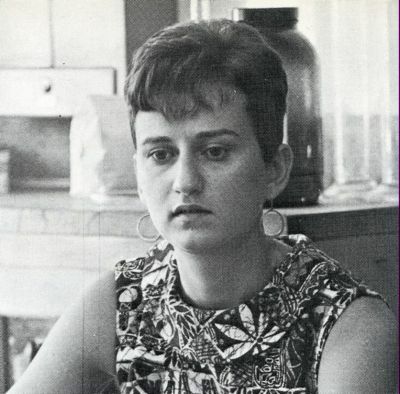 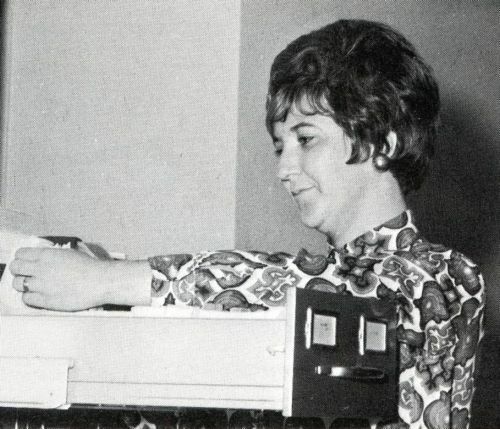 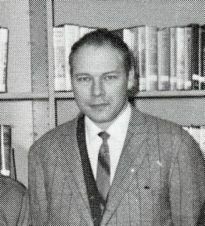 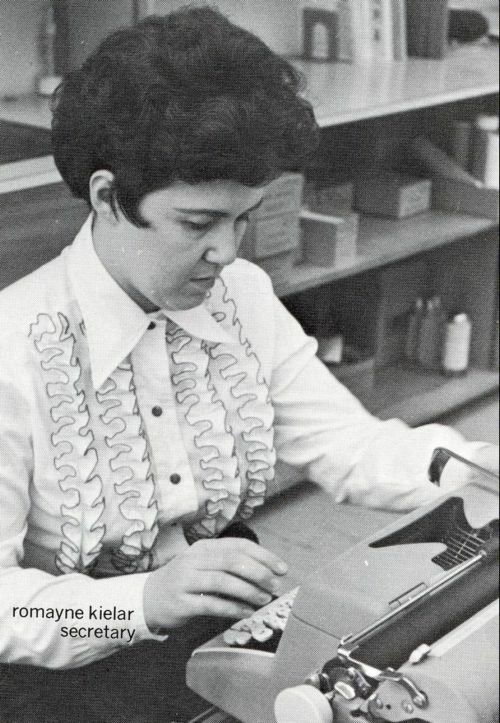 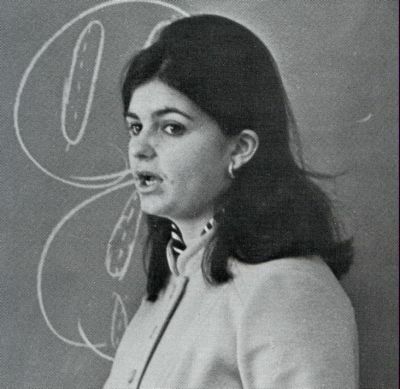 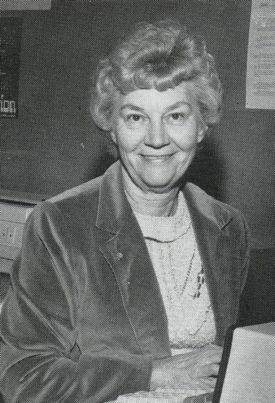 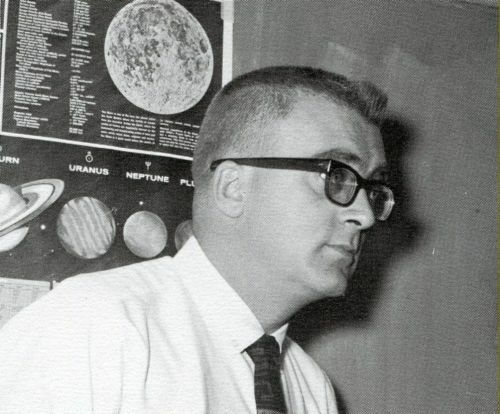 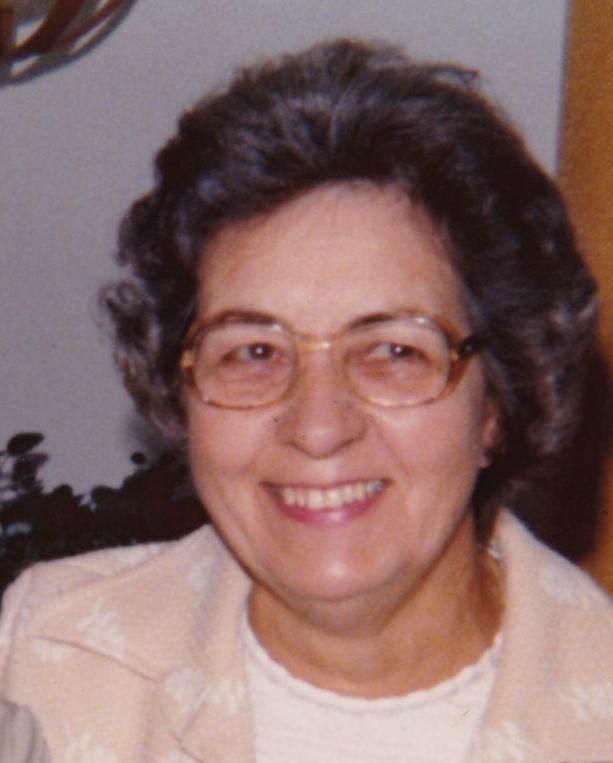 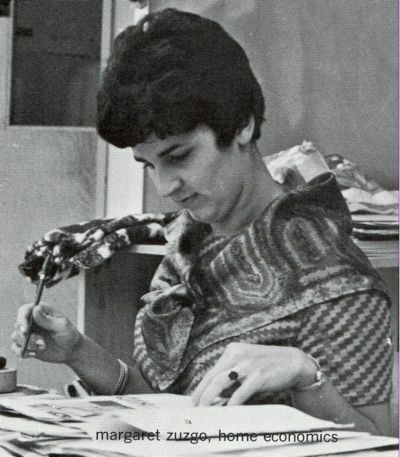 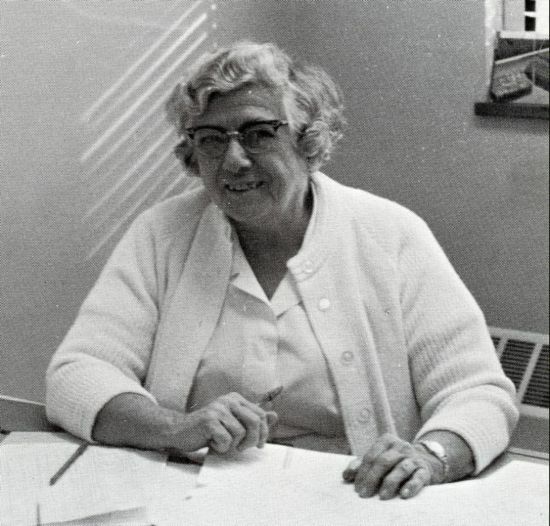 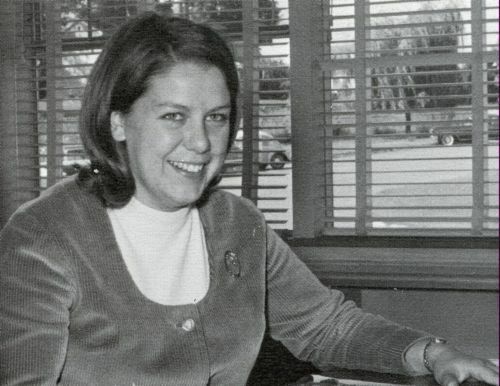 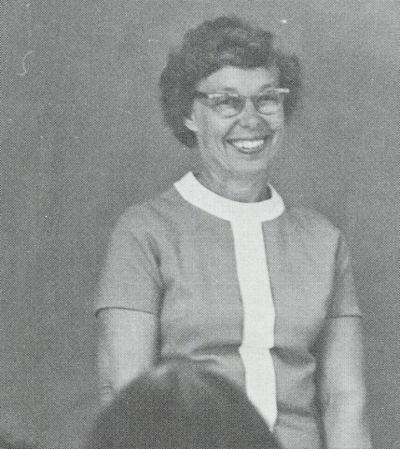 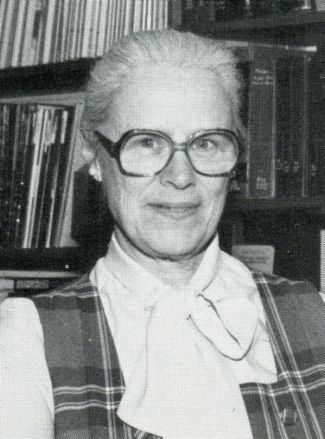 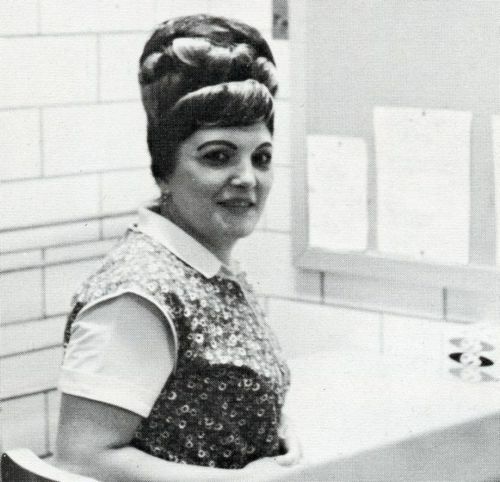 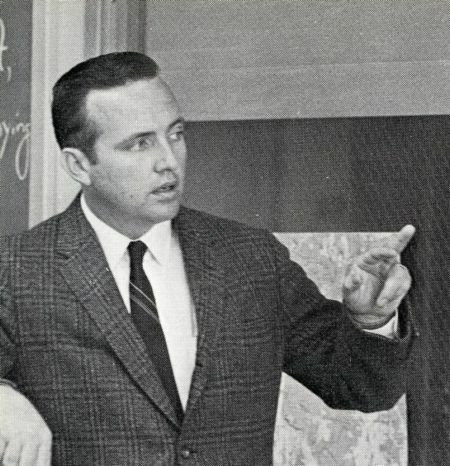 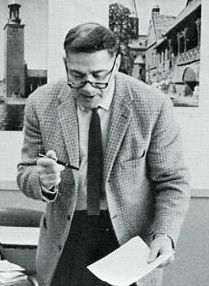 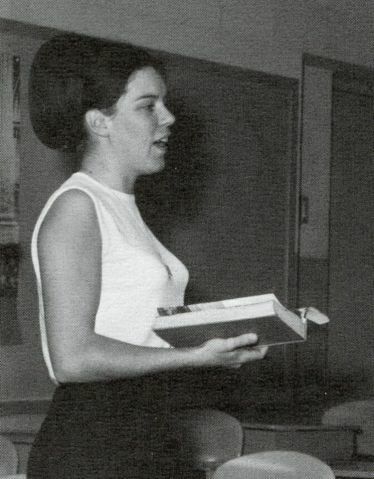 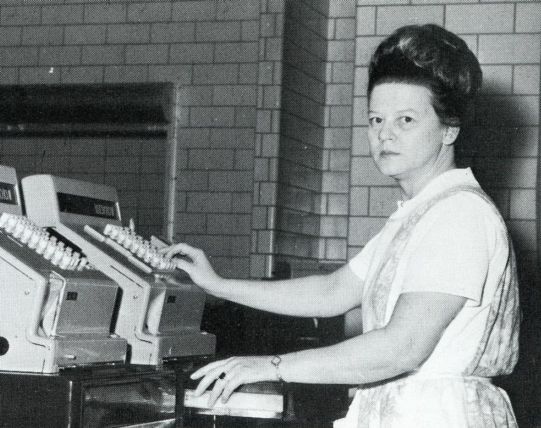 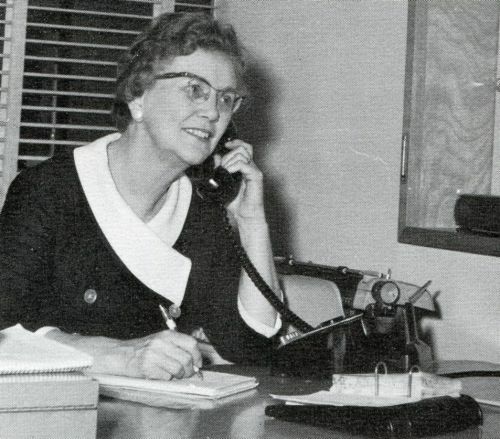 Miss Kerr was an educator and coach at ELHS from 1969 through 1988. 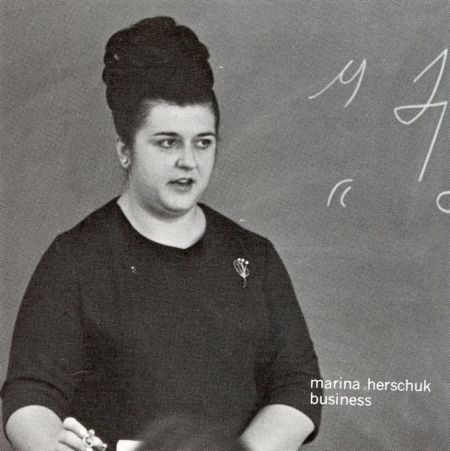 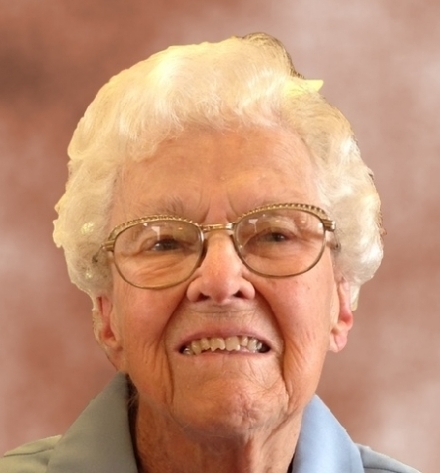 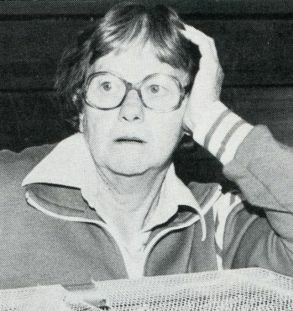 She coached girls softball, girls swimming and diving, boys diving, and synchronized swimming, producing dozens of champions. 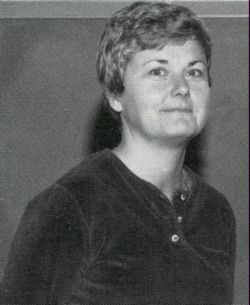 She amassed over 110 wins as a girls swim coach and won six consecutive league championships. 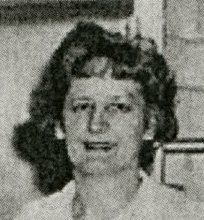 She had more first place finishers in girls and boys diving than any other coach during her years as coach and mentor. 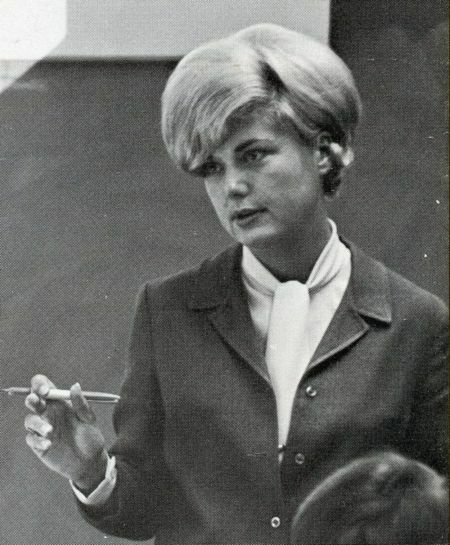 After leaving ELHS Miss Kerr earned an MBA at USC and began a career in healthcare management. 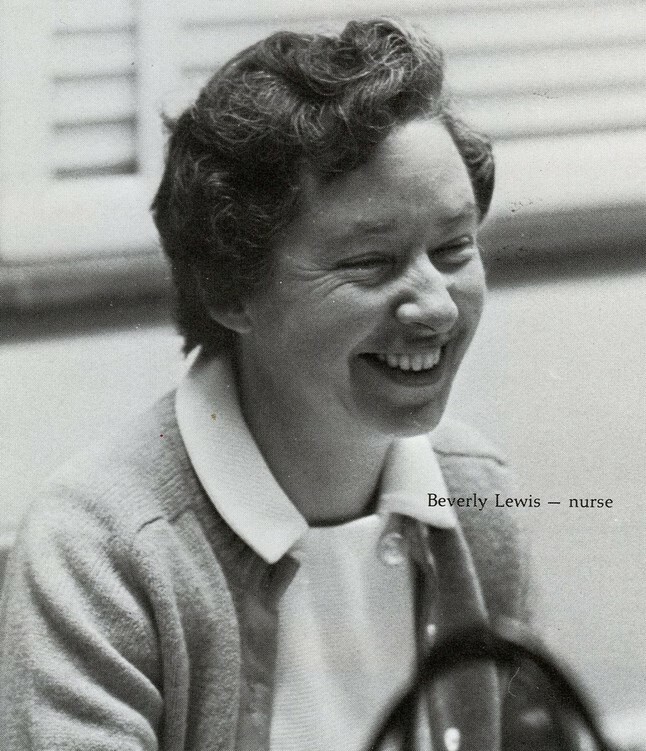 She currently lives in the Finger Lakes region of New York where she is Director of Performance Improvement at Thompson Health in Canandaigua, NY. 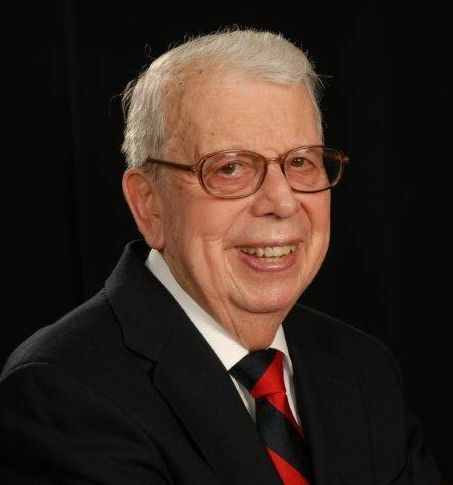 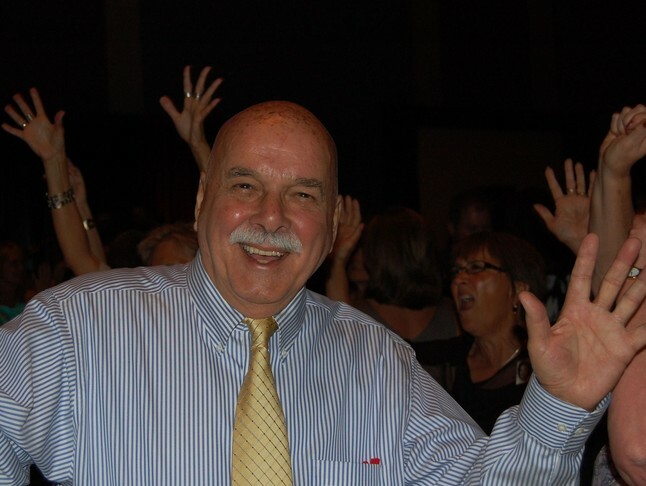 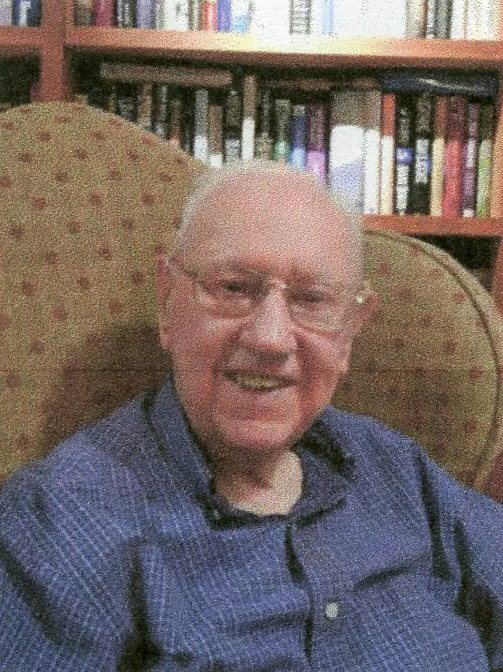 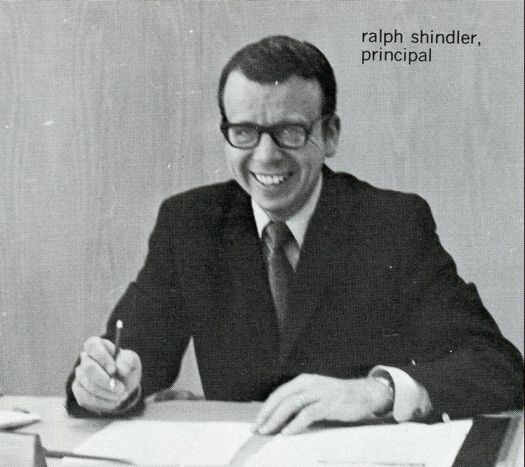 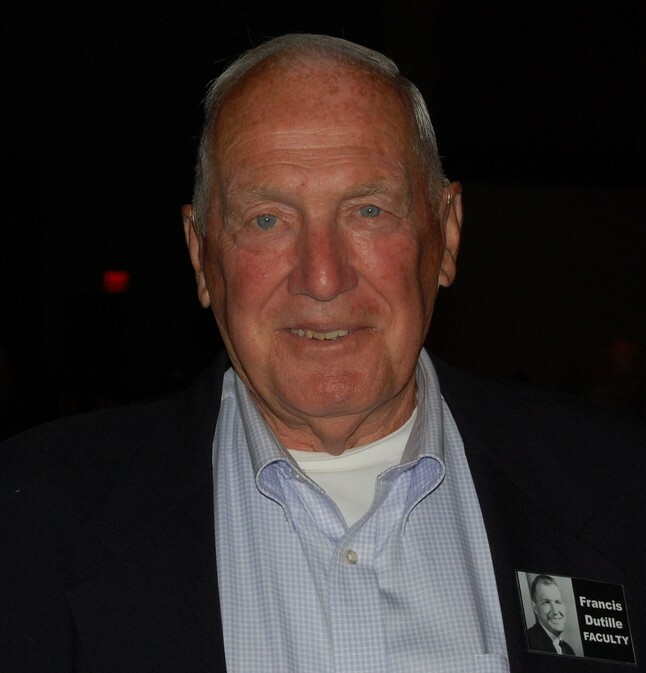 Our principal, Mr. Ralph Shindler, in 2013. 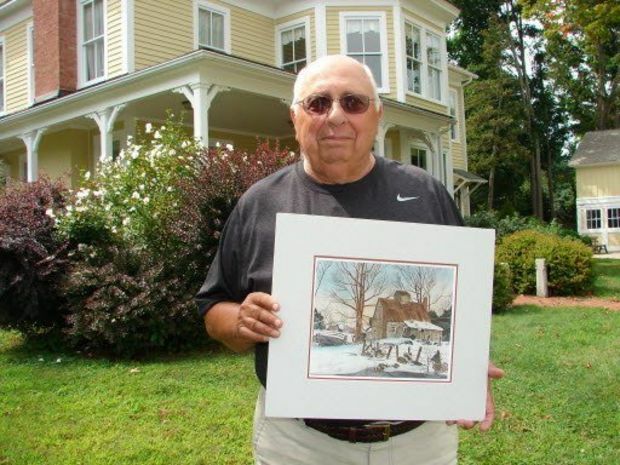 English teacher Mr. Robert Mazzariello prior to a book signing and art show of his paintings at the Norcross House in East Longmeadow in September 2014. 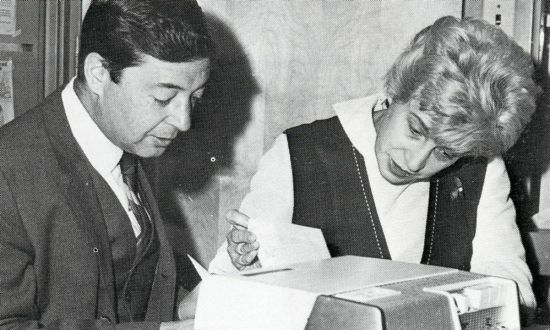 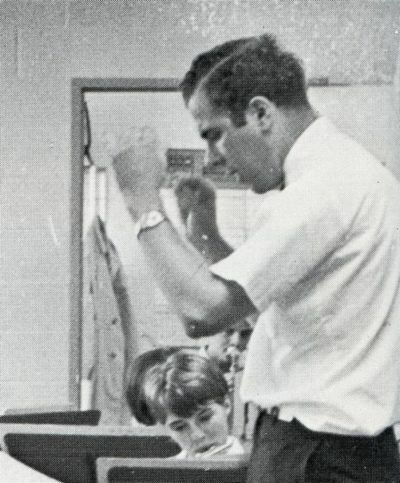 Supervisor of attendance Mr. Alfred Desmond with his daughter, Donna Desmond-Crafts, ELHS 1967, in May 2015. 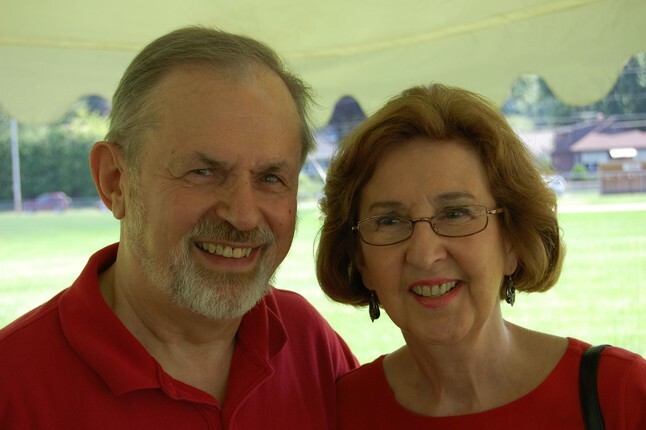 Assistant principal and science teacher Mr. John Katsoulis and his wife, Beverlee in 2015. 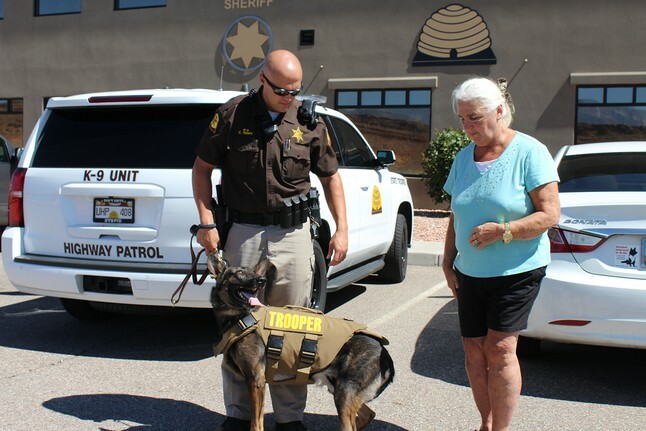 Home economics teacher Mrs. Margaret Manazer, whom we knew as Miss Margaret Zuzgo, with Utah Highway Patrol trooper Chris Terry and service dog Titan in July 2015. 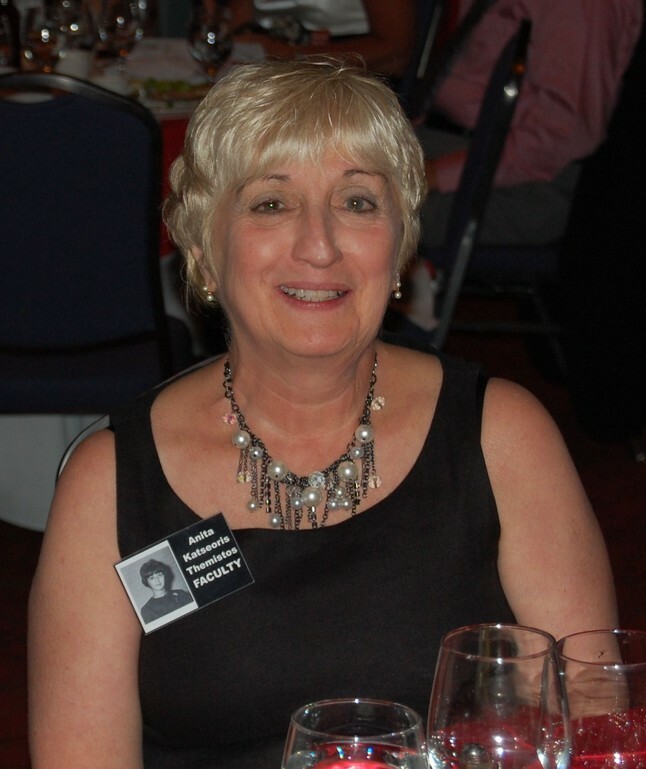 Mrs. Manazer donated $950 to purchase a stab and bulletproof vest for Titan. 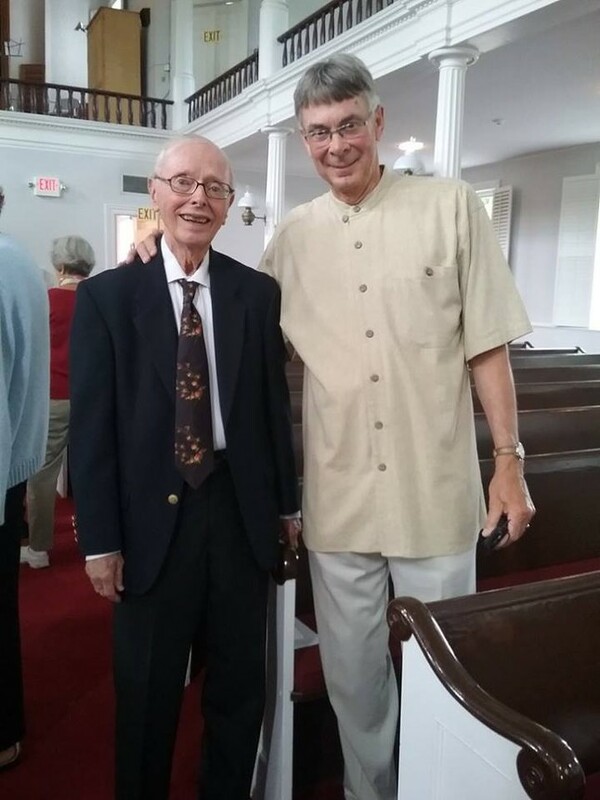 Vocal music teacher Mr. John Cheney, left, in August 2015 on the occasion of his retirement after eighteen years as the music director of the United Church of Christ, Church on the Hill, Lenox, MA. 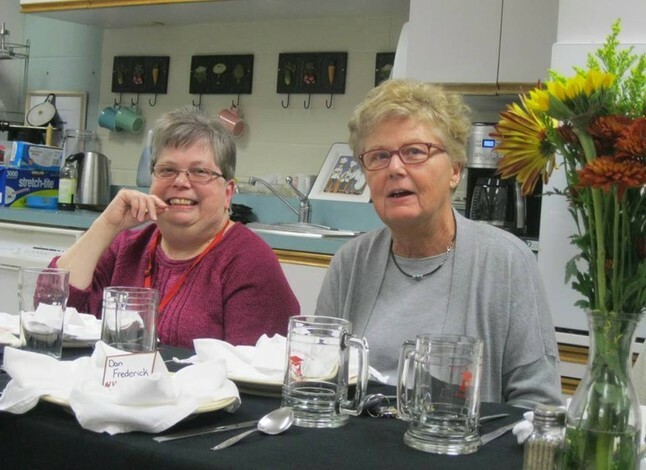 Foreign languages teacher Miss Deborah Fay and math teacher Mrs. Diane McCormick in November 2015 during a luncheon at ELHS. 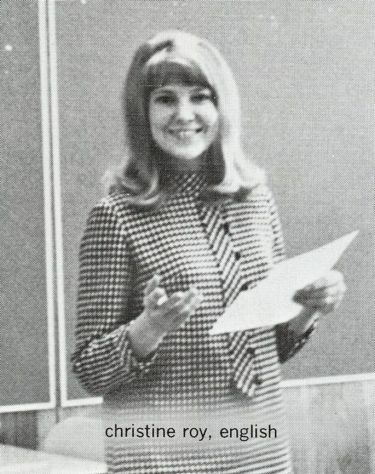 Photo courtesy of Dennis Dowling. 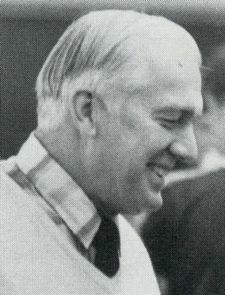 Band director Mr. James Harwood in 2016. 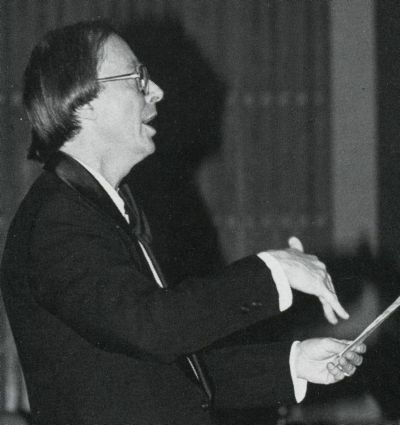 Mr. Harwood serves as the president of Harwood Management Group, Inc. in New York City, building and managing the careers of singers, conductors, and stage directors. 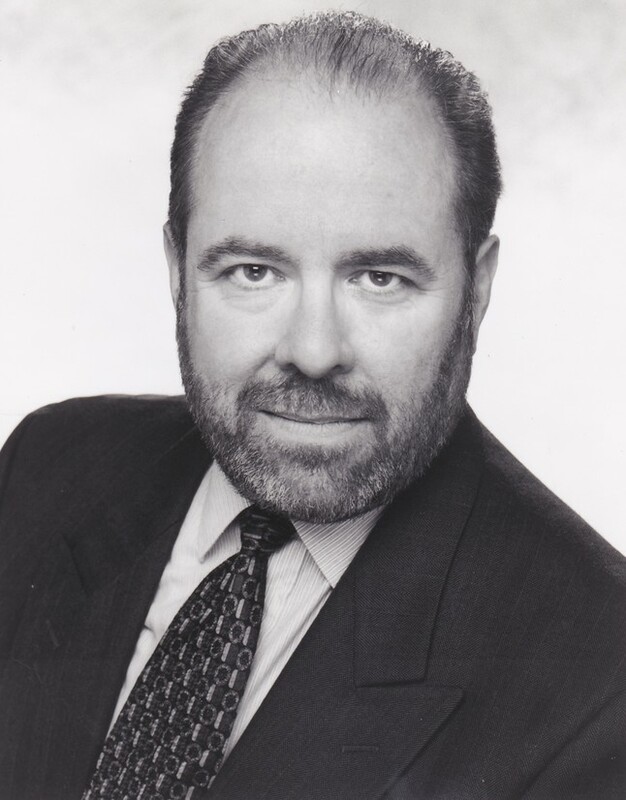 Please click here for his website. 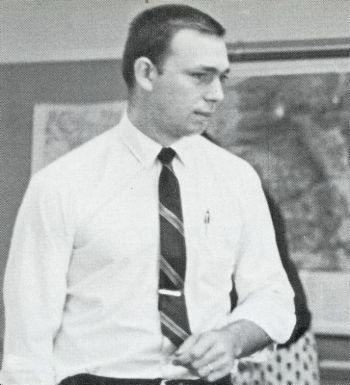 East Longmeadow Public Schools superintendent Dr. Wayne Porter in 2016. 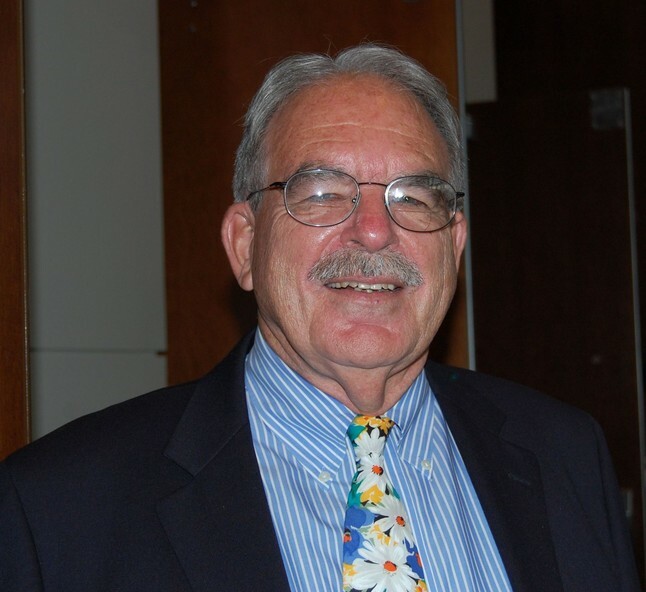 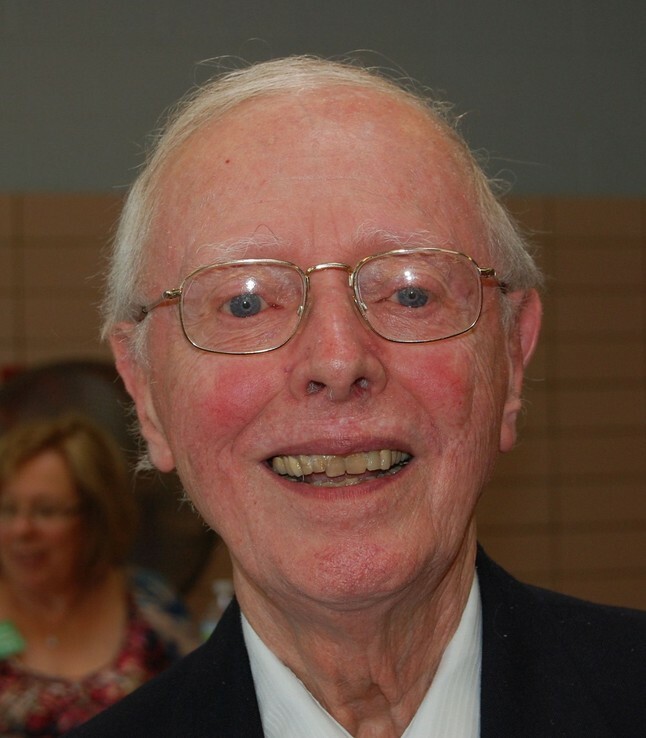 Following the passing of superintendent Mr. Robert Jarvis on Mar. 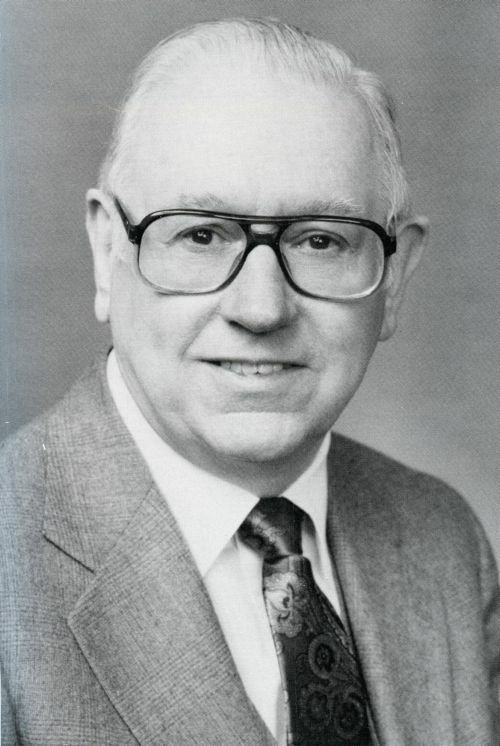 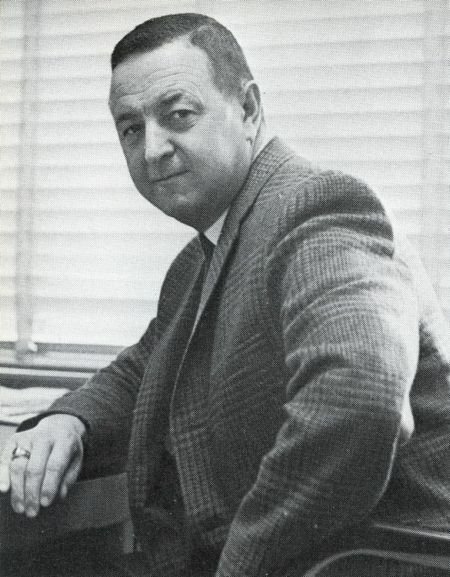 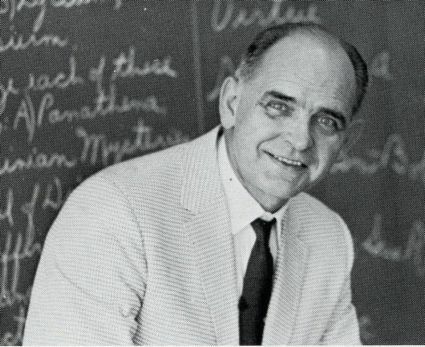 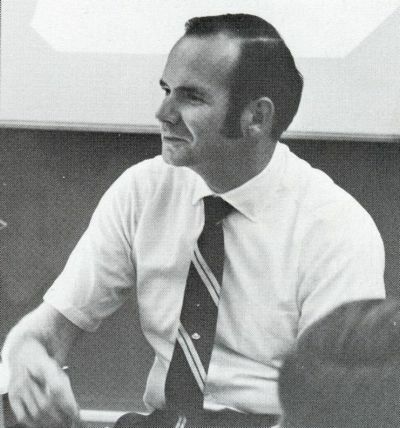 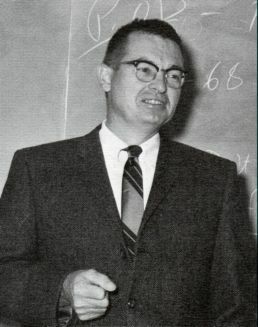 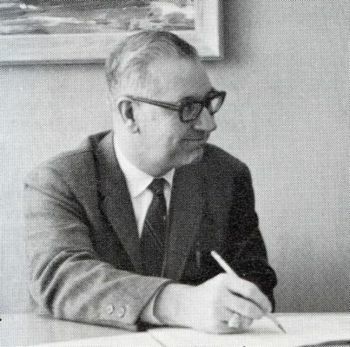 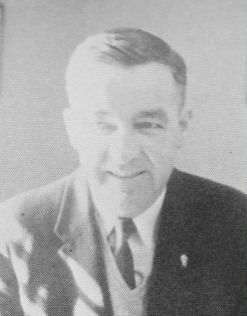 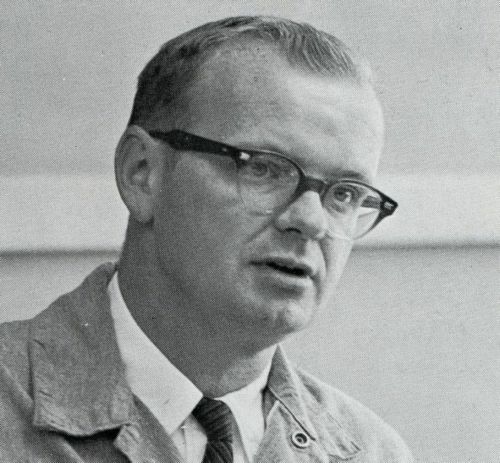 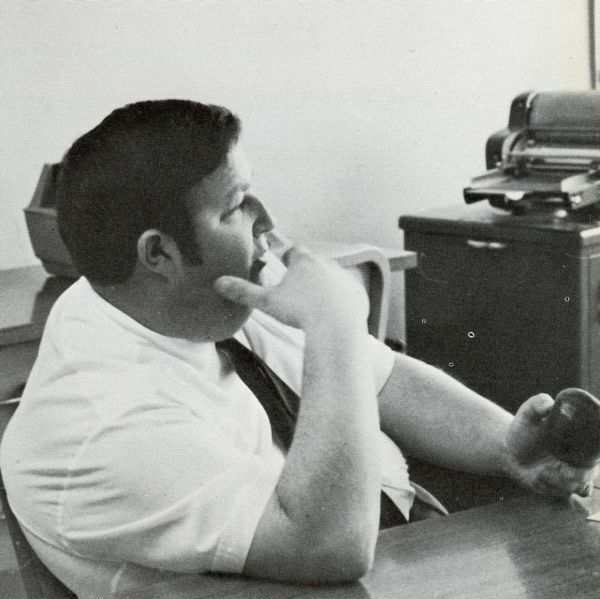 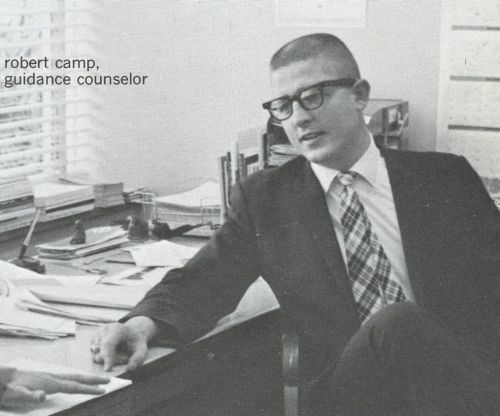 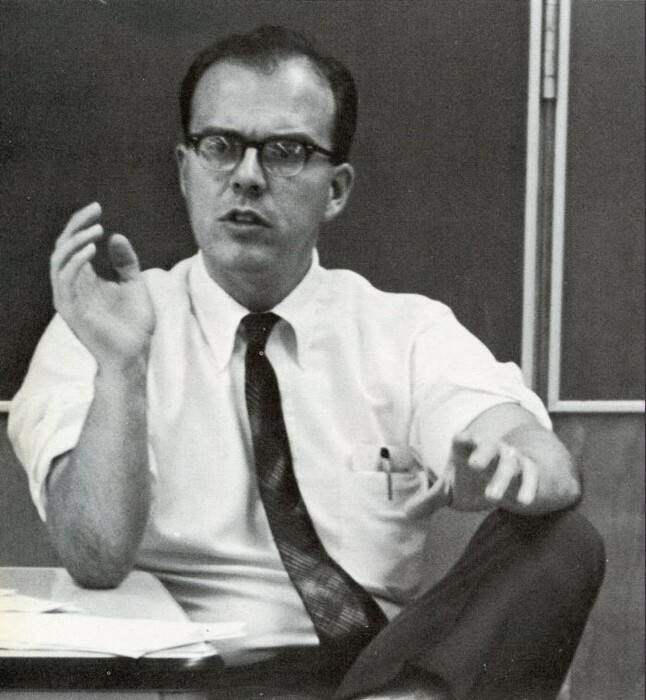 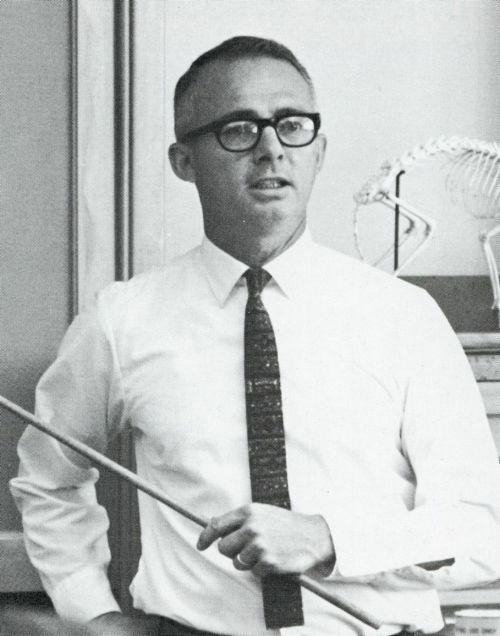 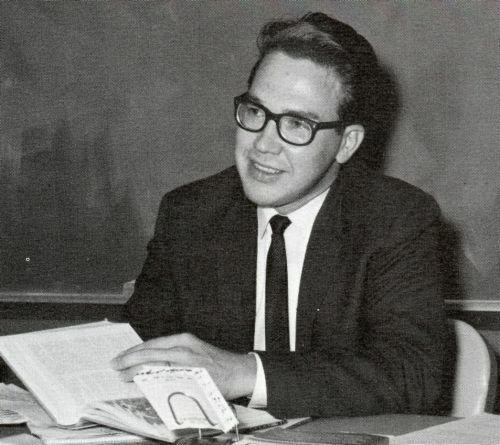 1, 1970, Dr. Porter became superintendent for the remainder of our senior year and continued in that position until his retirement in 1984. 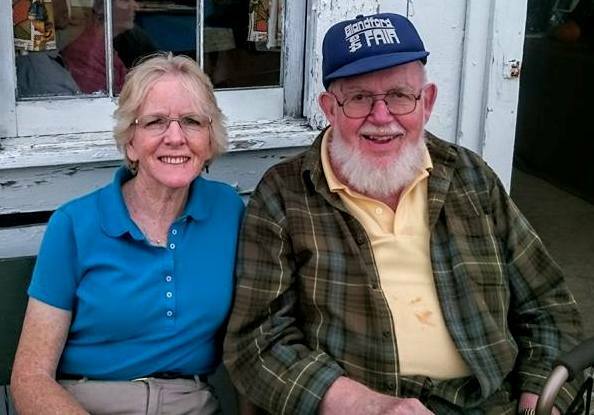 He then moved back to Maine, returning to East Longmeadow around 2012 to live at Bluebird Estates. 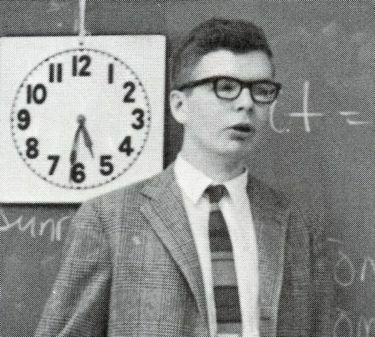 He now resides in West Groton, MA. 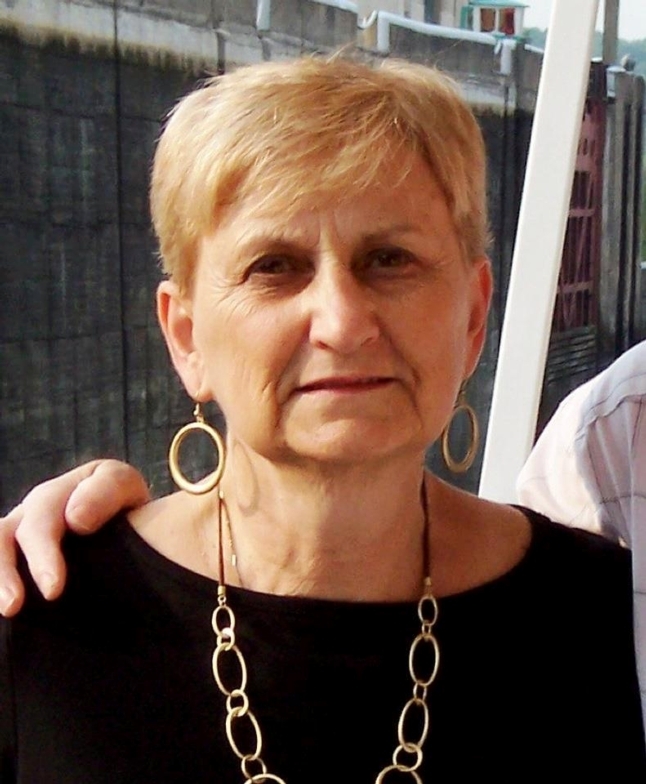 English teacher Mrs. Anita Katseoris Themistos in October 2016. 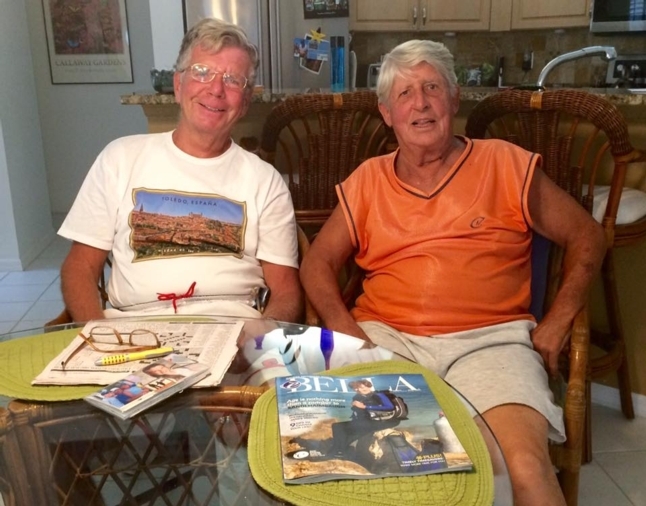 Foreign languages teacher Mr. Dennis Dowling and guidance counselor Mr. Robert Camp in Naples, FL in October 2016. 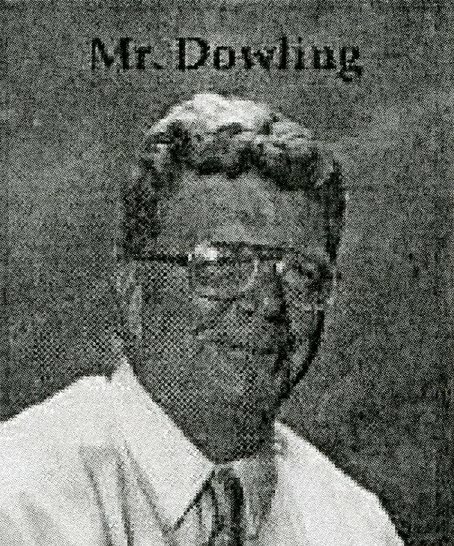 Photo courtesy of Mr. Dowling. 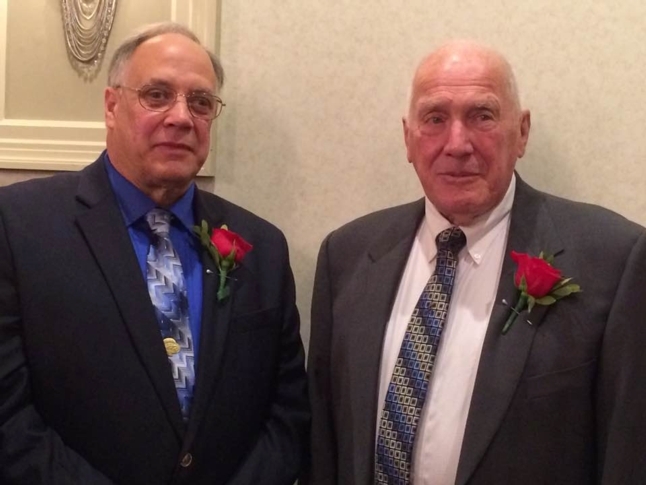 Classmate Peter Ouellette with math teacher and track coach Mr. Frank Dutille on Nov. 19, 2016, at the ELHS Athletic Hall of Fame banquet, in which Peter was inducted into the hall of fame. 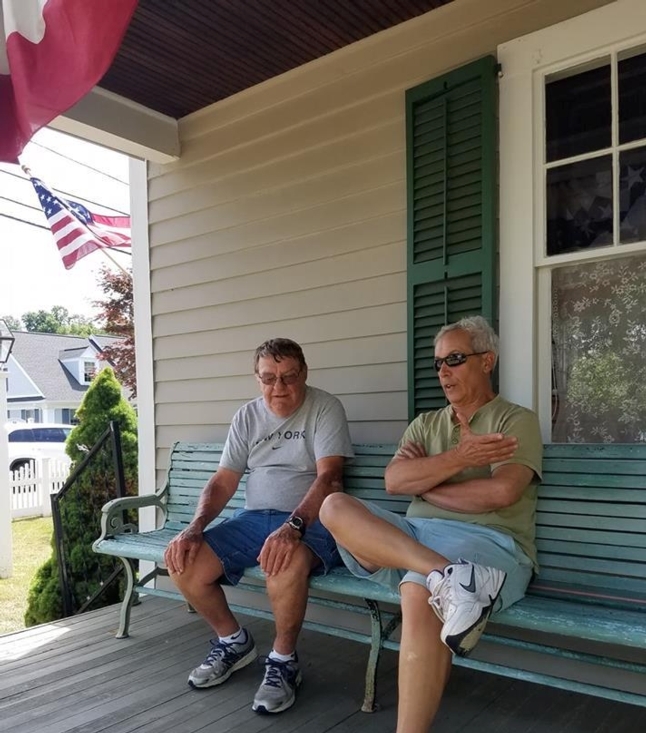 Business teacher Mr. Ralph Cooley and classmate Tony Zampiceni relax on the porch of the E. L. Historical Museum, 87 Maple St., on Jun. 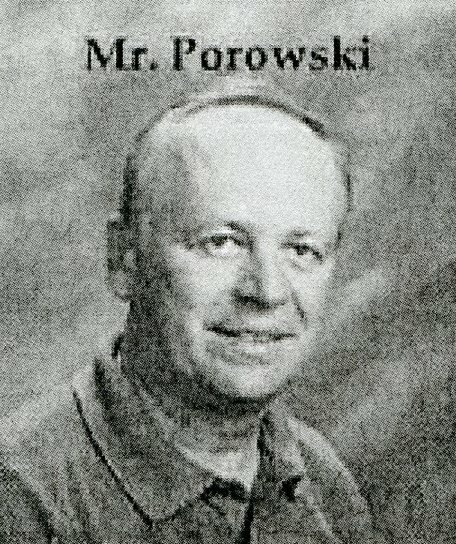 16, 2018. 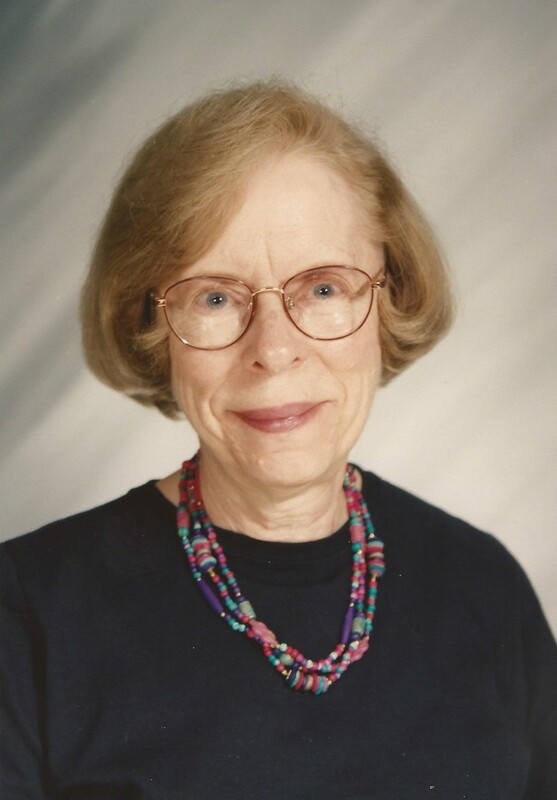 Photo by Gina Szynkaruk. 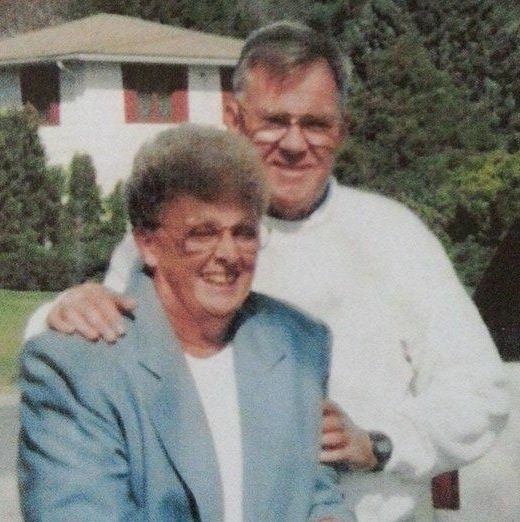 Business teacher Mrs. Carol Whalen, in an undated photo, with her brother, Lynn Anderson, who passed away in 2018. 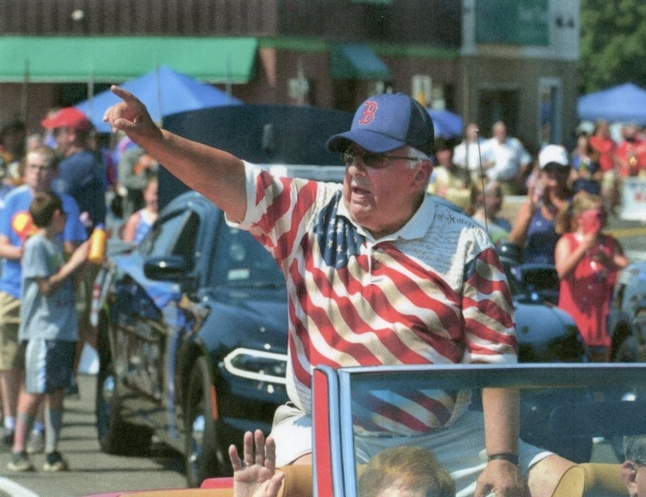 English teacher Mr. Bob Mazzariello waves to the crowd during the 2018 Fourth of July parade in East Longmeadow. 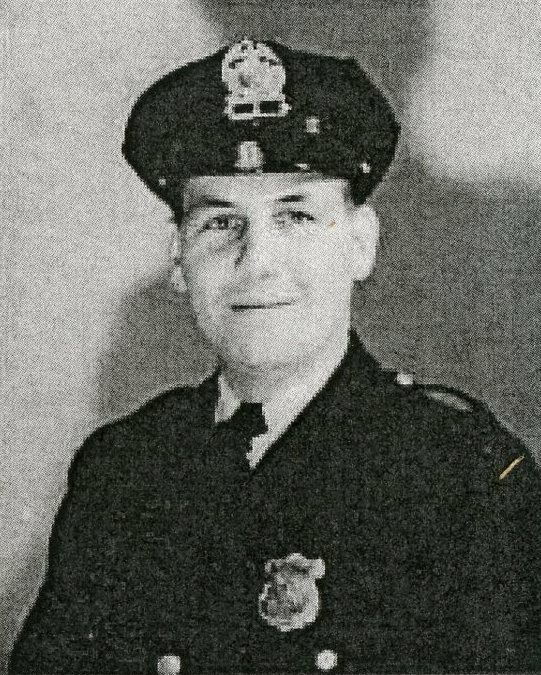 He served as the parade's grand marshal. 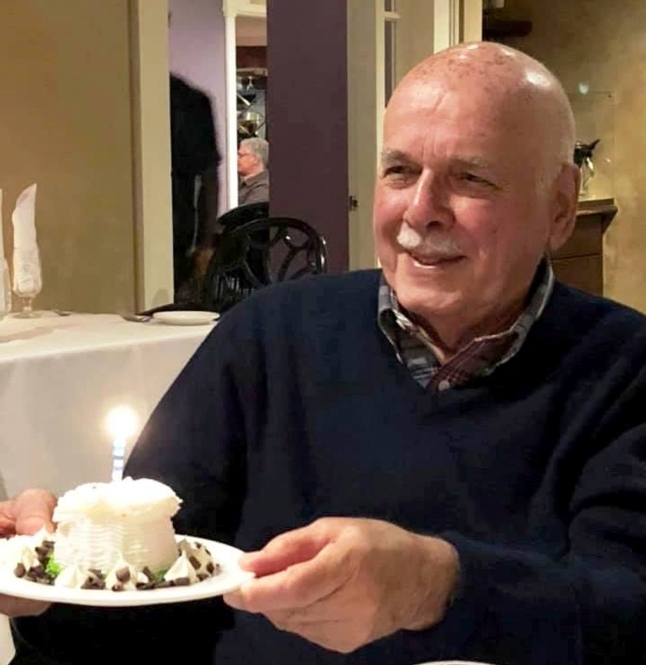 Business teacher Mr. Joseph St. Germain celebrates his 90th birthday on Nov. 16, 2018. 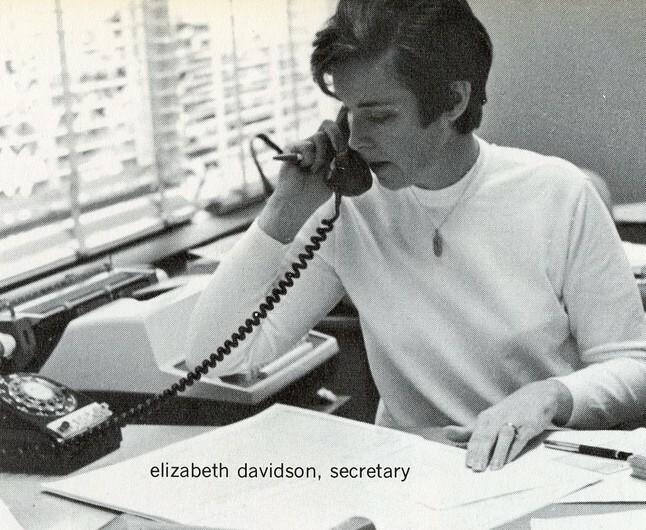 Please contact us if you have an update to the status or location of a faculty or staff member, or a photo you'd enjoy sharing.